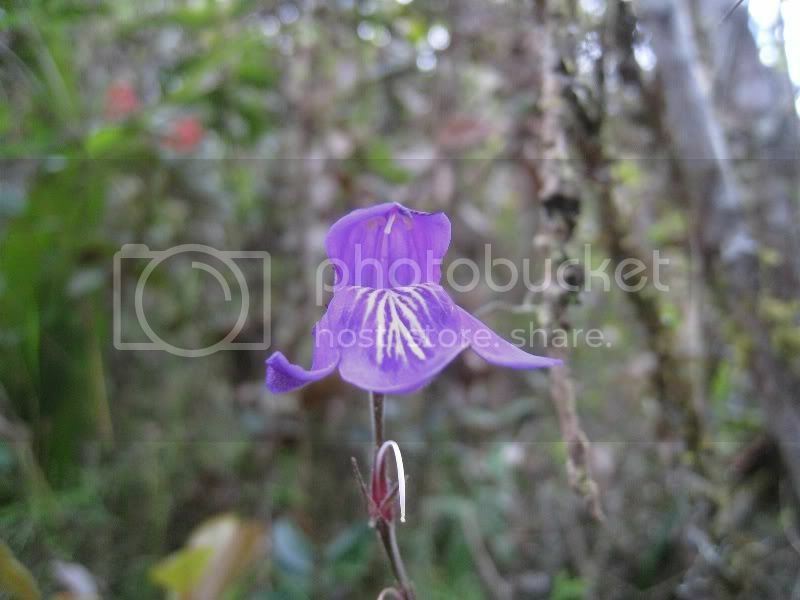 Here are the pictures from our time in Southern Peru. 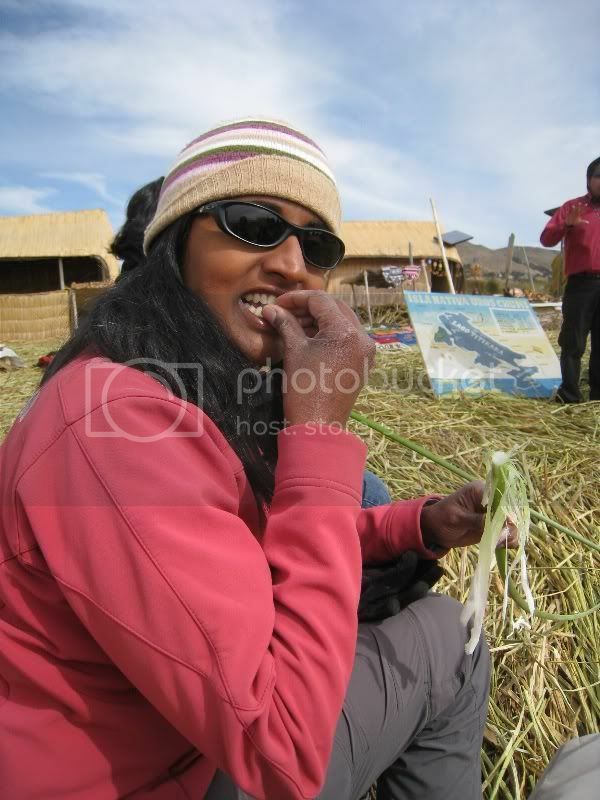 We crossed the border from Bolivia and the first stop in Peru was the city of Puno on the shore of Lake Titicaca. 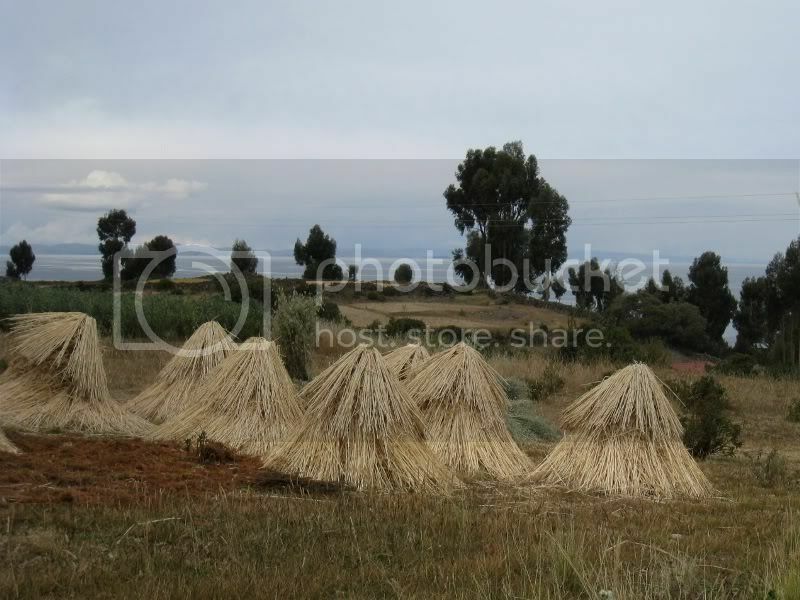 From there it was easy to organize a tour to visit some of the islands in Lake Titicaca. 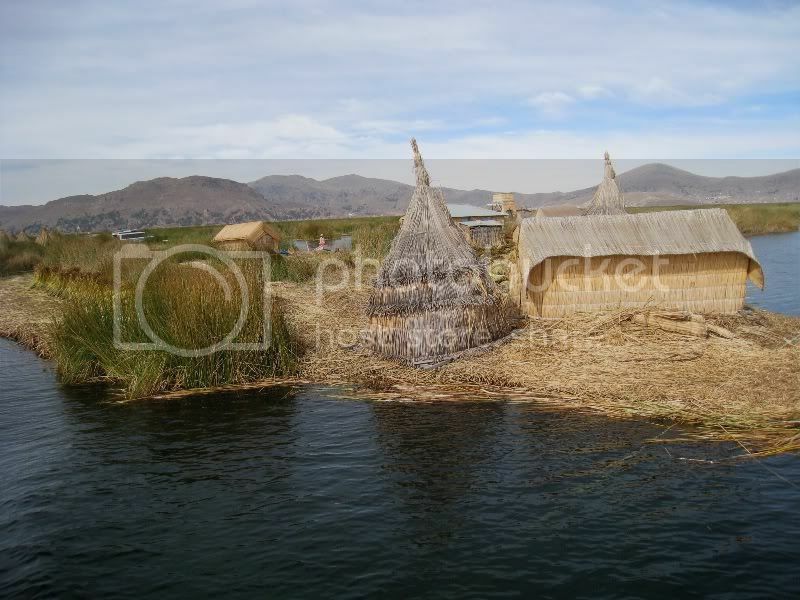 The first islands we saw were the Uros islands. These are man-made floating islands. The islands are made out of reeds. 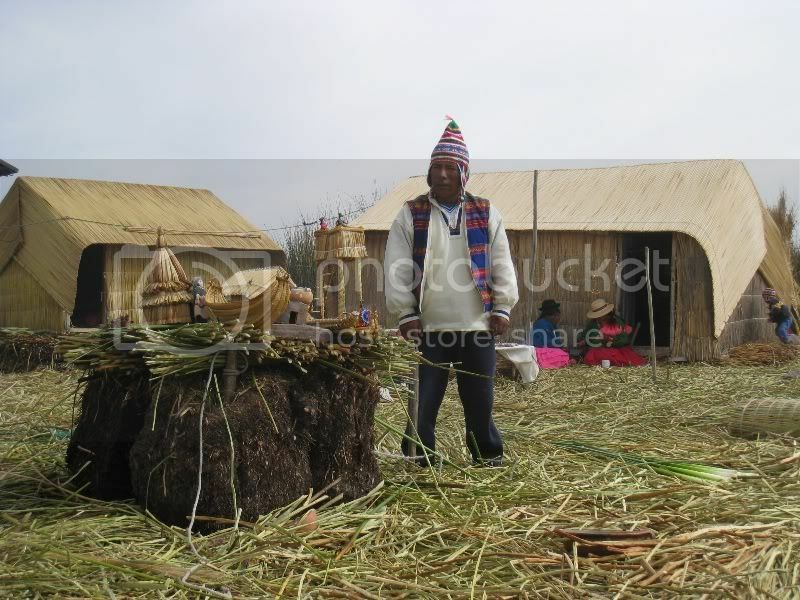 Here a local is just in the process of cutting those reeds. The mayor of this island explained to us how they construct the islands. 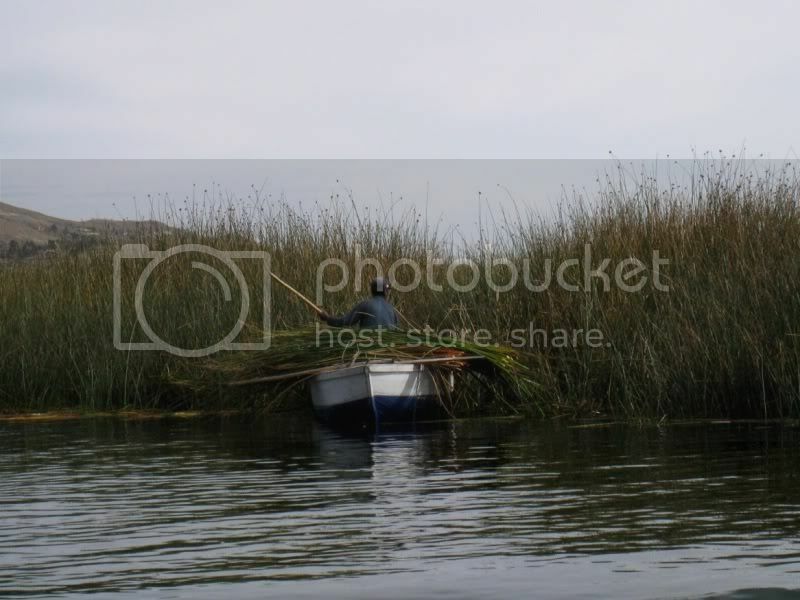 And you can even eat those reeds. 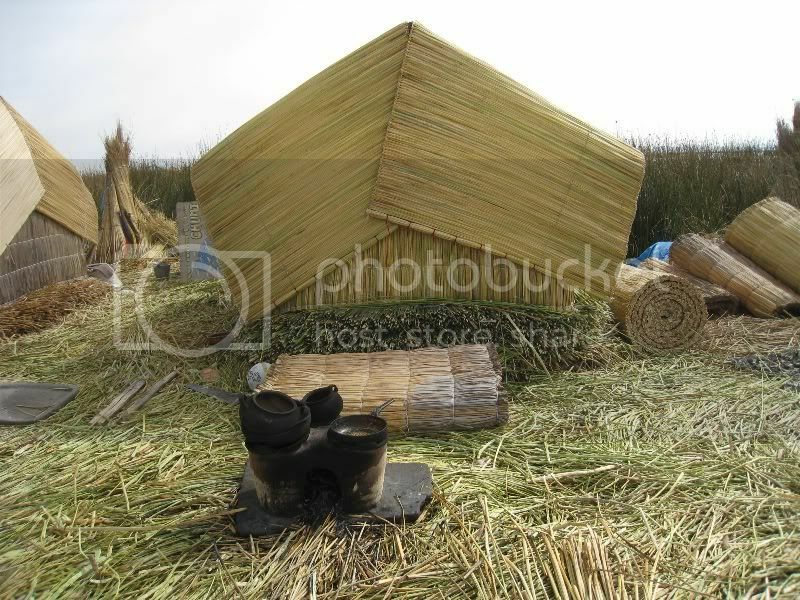 One of their huts and fireplace in front of it. 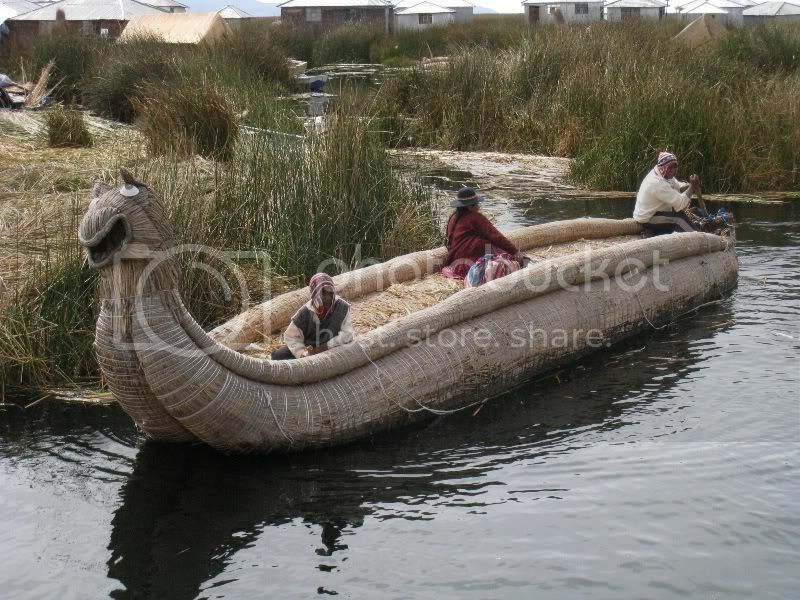 There are lots of things that can be built with the reeds, like these big boats. 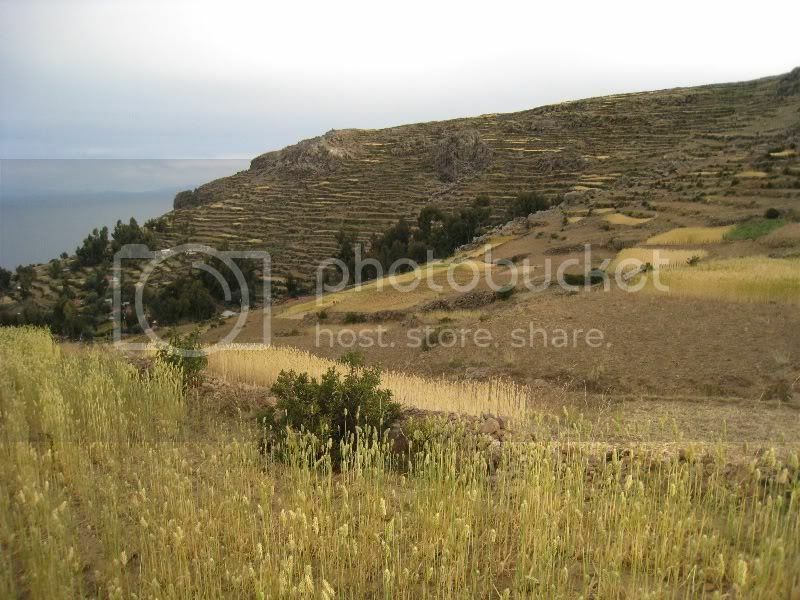 Most of the island is terraced to grow grain and corn. 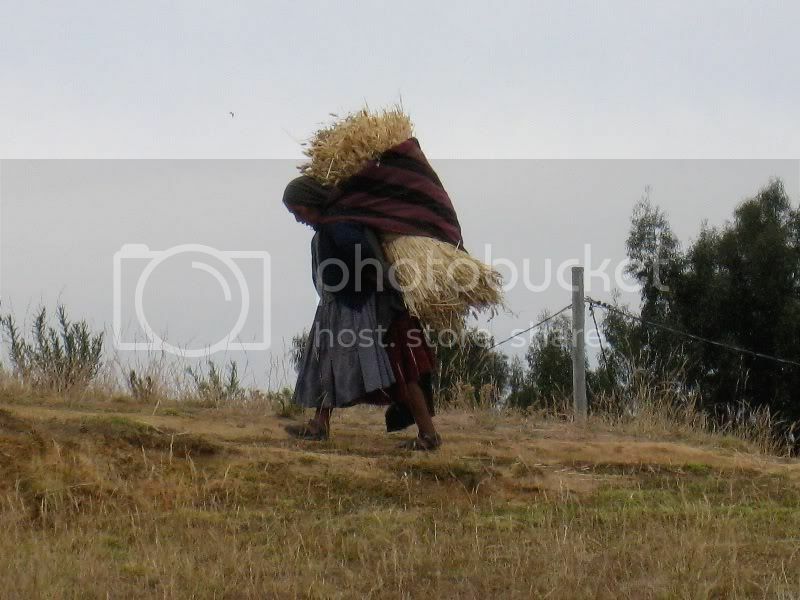 The harvest involves lots of manual labor. We stayed for a night with a local family with three kids. 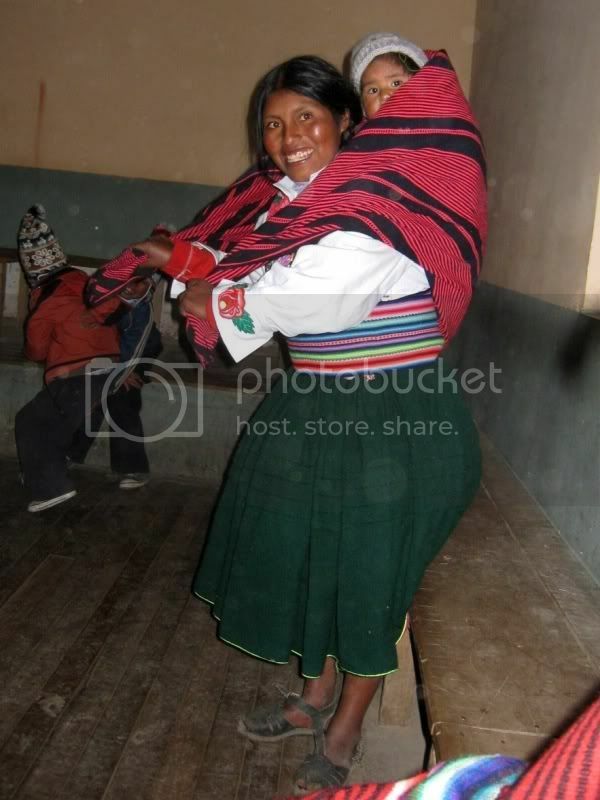 Life is very simple on the island of Amantani. 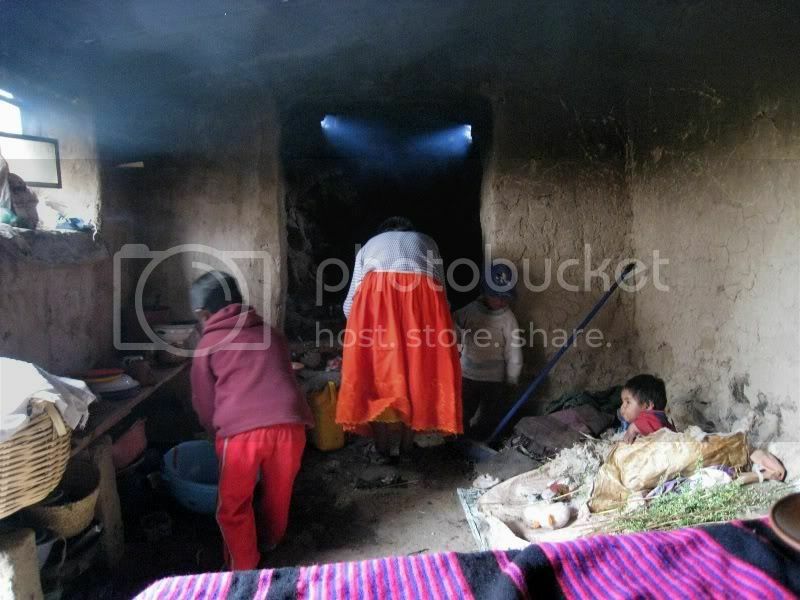 The kitchen is just a small room with a wood fire place and dirt floor. 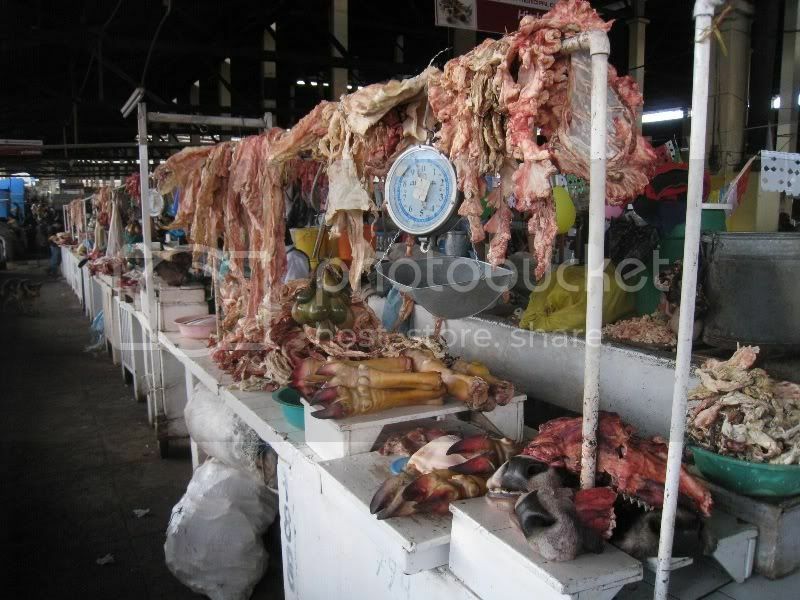 Here the mother is just preparing our lunch. Their diet consists mostly of grains, corn, potatoes, and occasionally some fish or chicken. There are no fruits on the island. At night we dressed up for a party. Note the height difference between our host mother and Jaya. (and Jaya is not really a giant). Oliver had to constantly watch his head when entering the doors. The youngest comes along everywhere on the back. 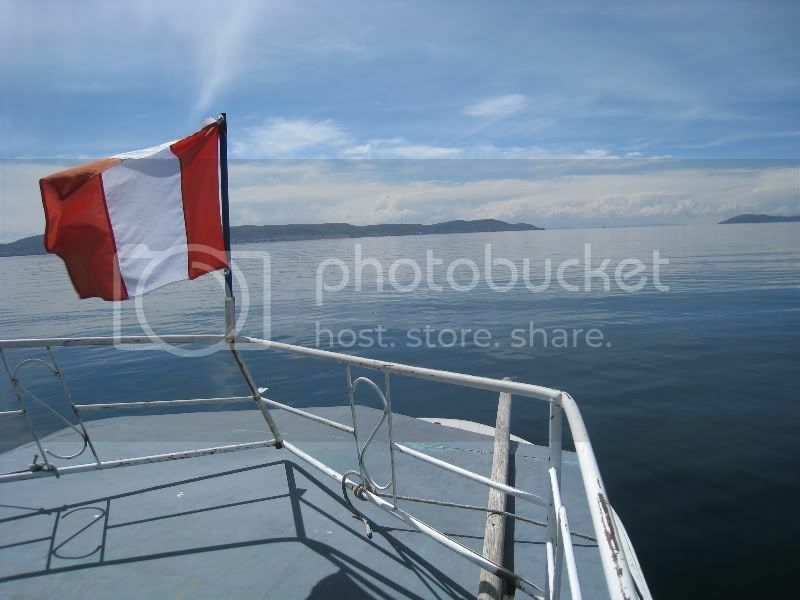 Next day we went to the island of Taquile. The island is well known for the knitting men. 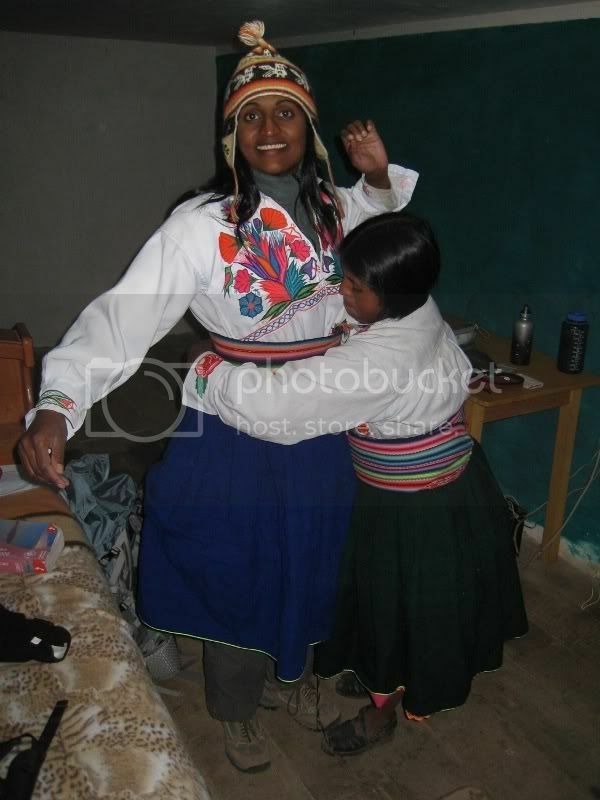 From Puno we took the Bus to Cuzco. There is a train, but unfortunately it only runs as a luxury tourist attraction, and we thought we could save the US$ 140 per person, considering that you have the same views from the bus. 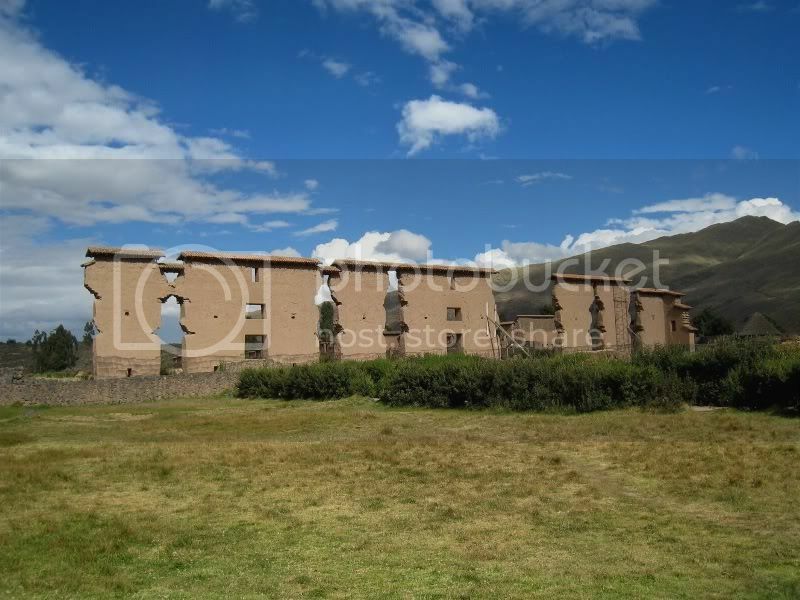 On the way we stopped at the Inka ruins of Raqchi. 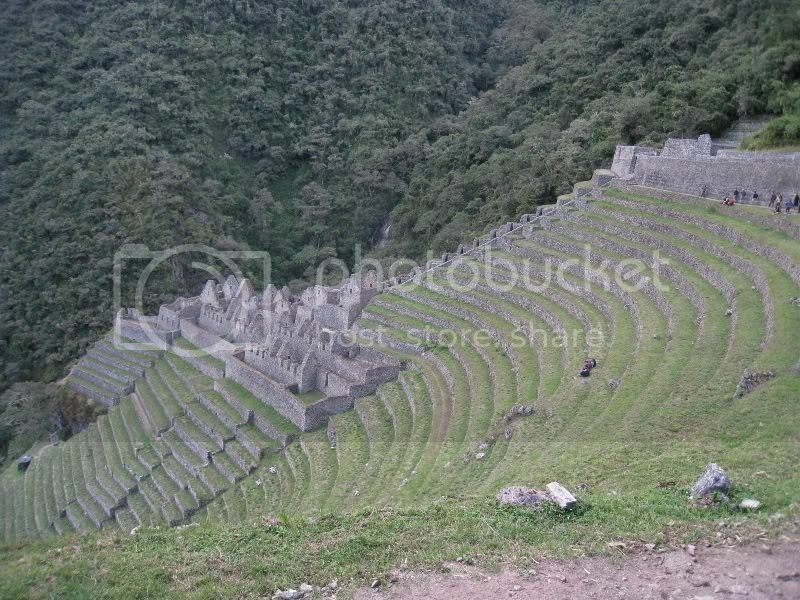 These are the remains of the temple of Wiracocha, which is believed to have been the largest single roof in the Inka Empire. 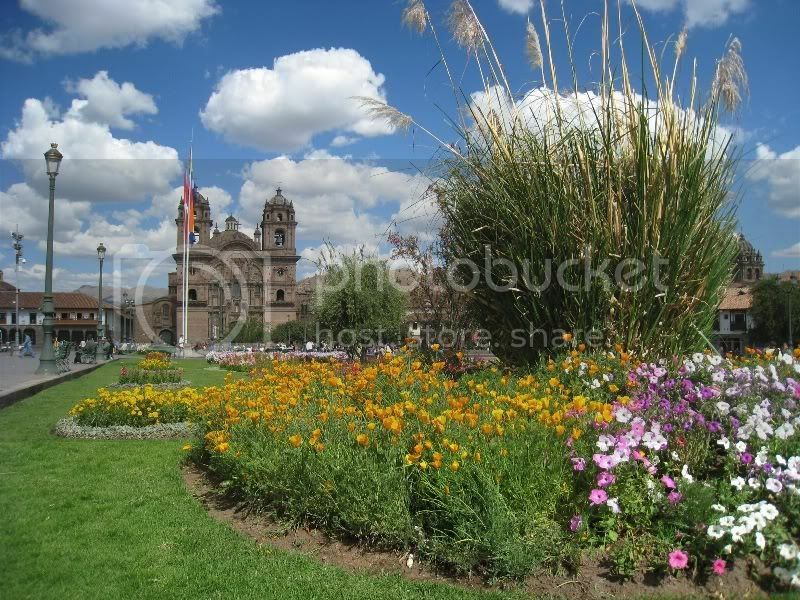 View from the terrace of our hostel onto the Plaza de Armas in Cuzco. Close-up with the cathedral in the background. 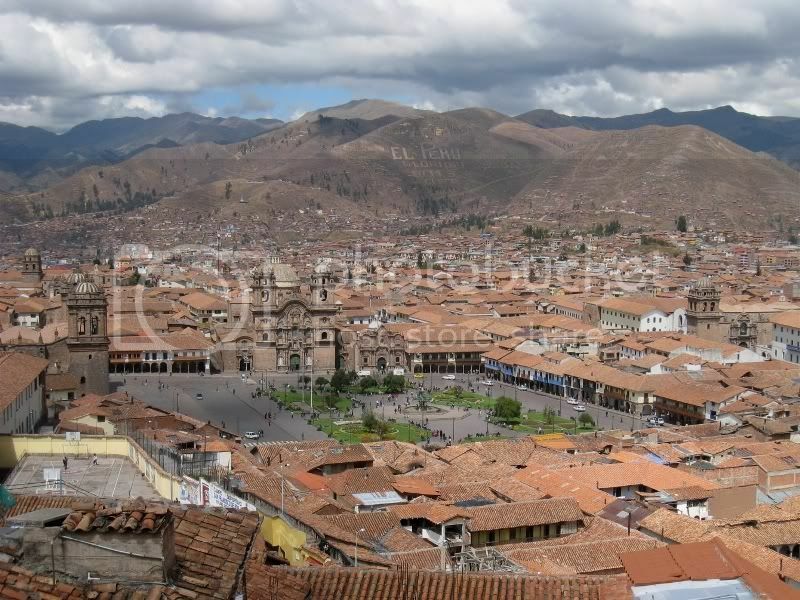 Cuzco was the capital of the Inka Empire and it is a very fascinating city. 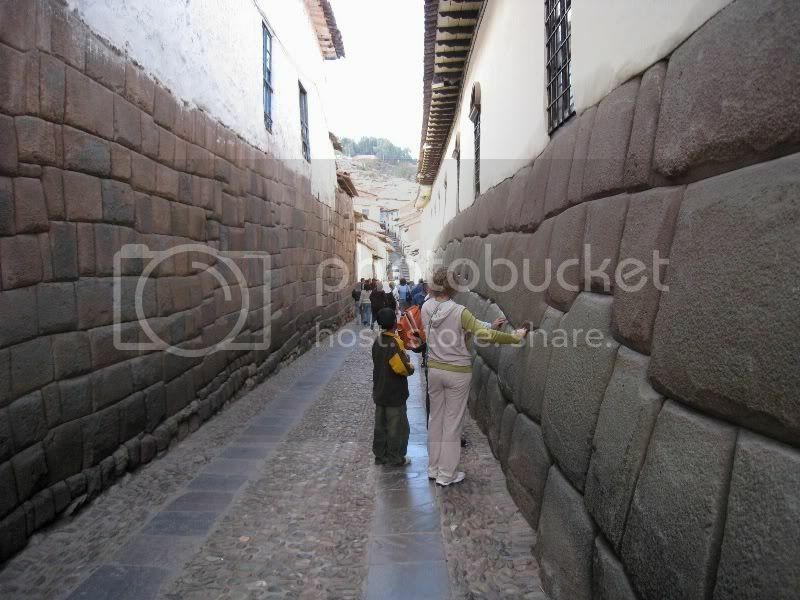 There are lots of those nice narrow streets with original Inka walls. 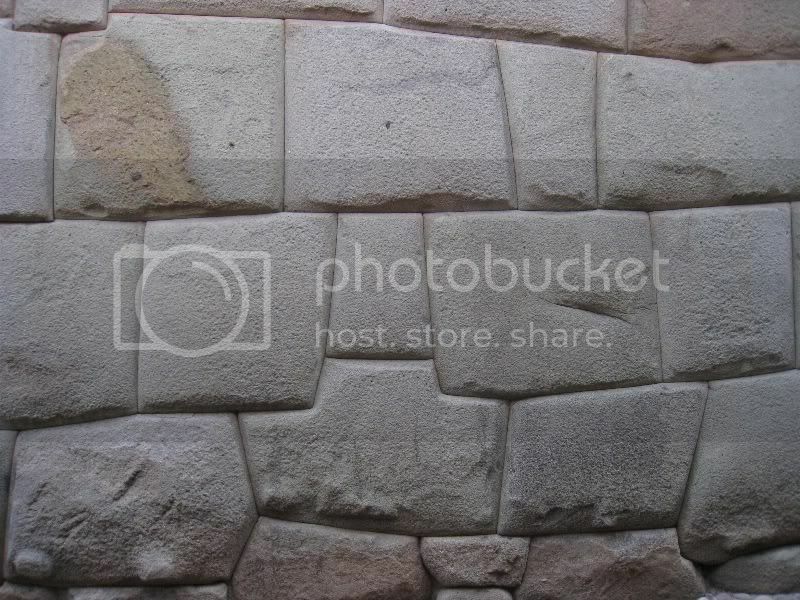 The Inkas were masters of the stonework. They fit huge rocks perfectly together. 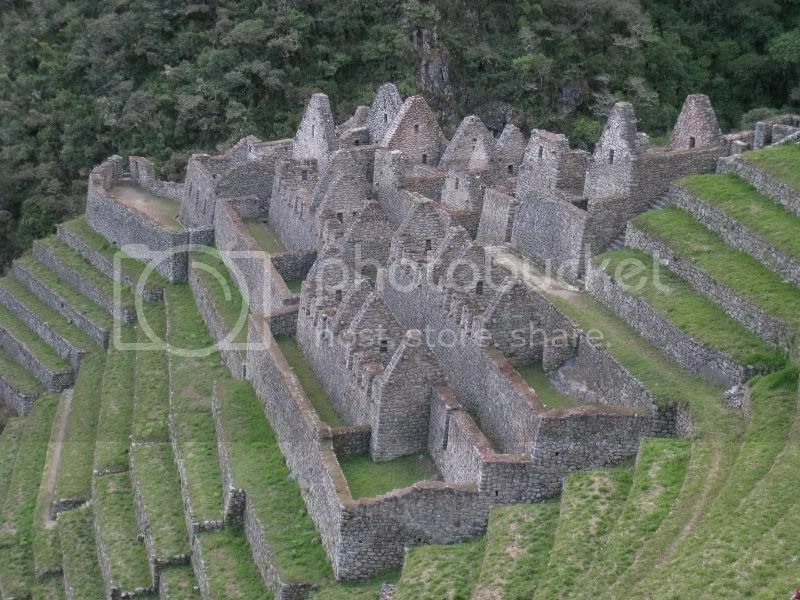 Most of those walls survived many earthquakes whereas buildings and churches built by the Spaniards who conquered the Inkas got destroyed. 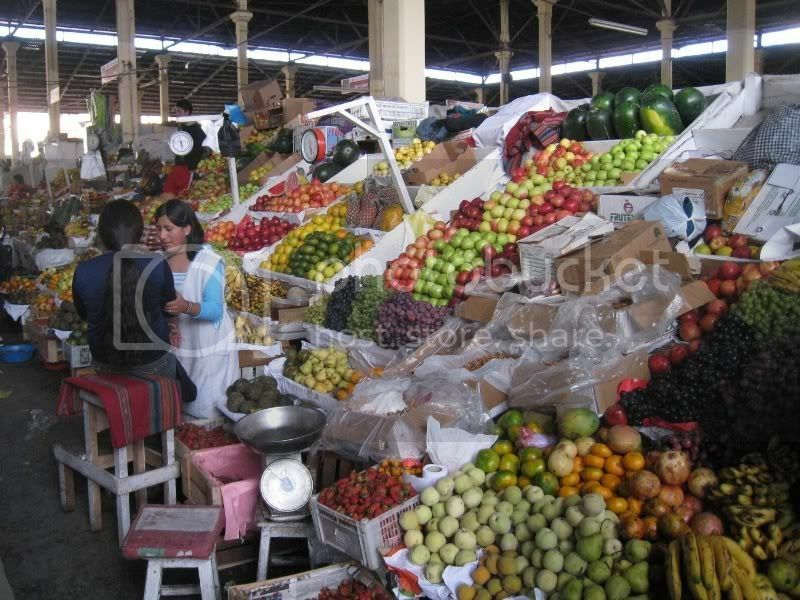 A visit to the local market is always on the program. In the meat section you can always find some interesting things. 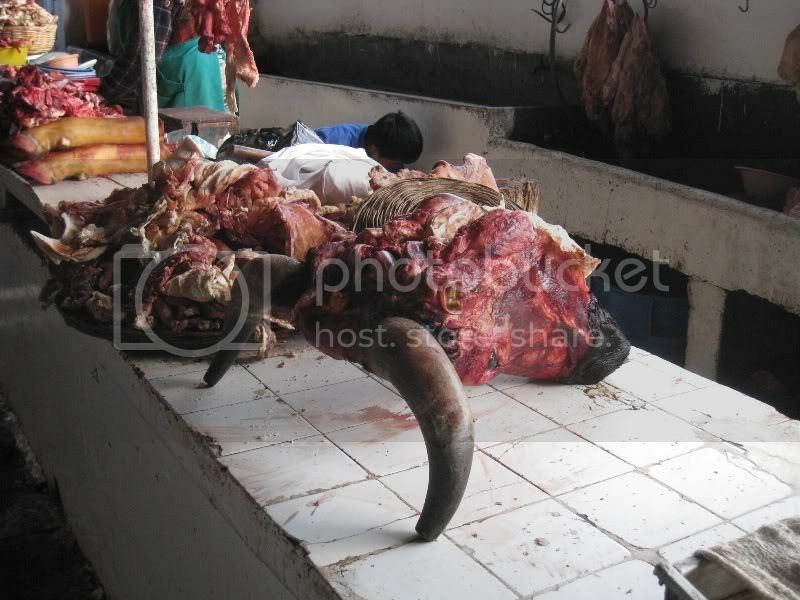 Here is a complete cow head for sale. 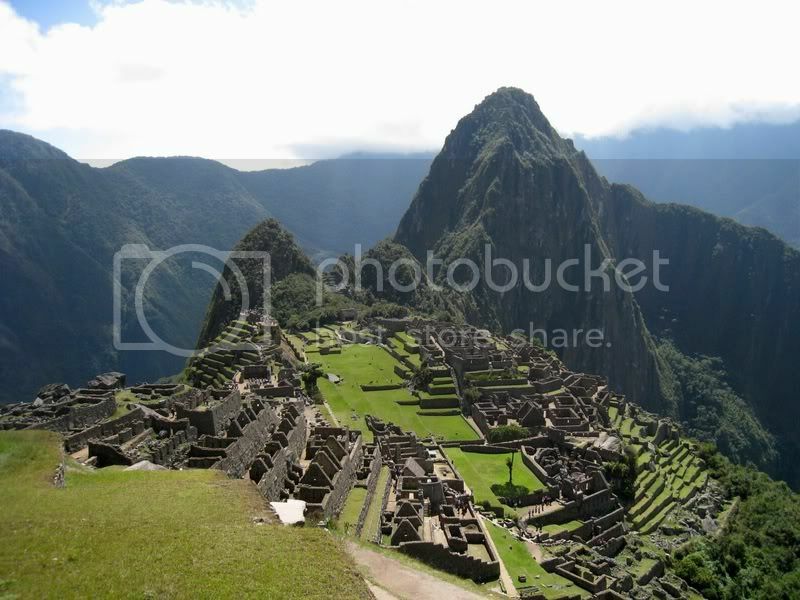 When you come to Peru you have to visit Machu Picchu. 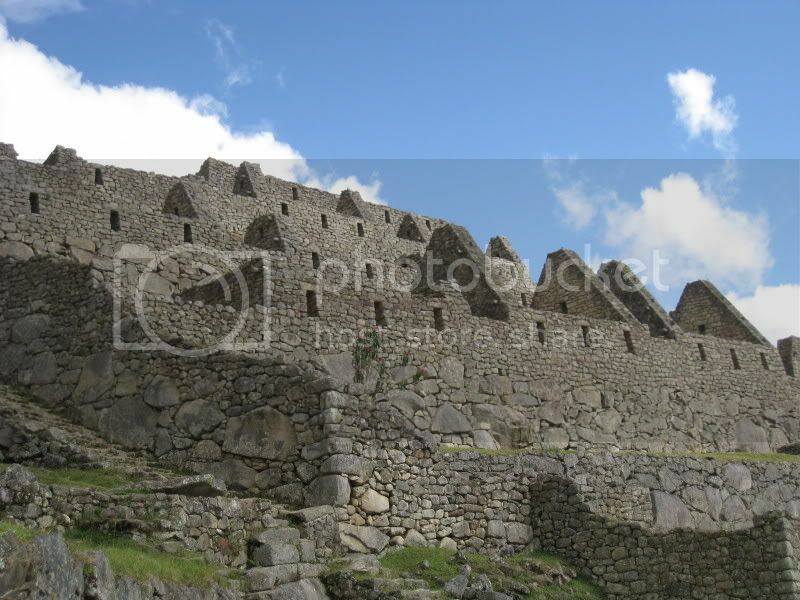 The fascinating Inka city (also called ¨the lost city of the Inkas¨) is one of the New Seven Wonders of the world. 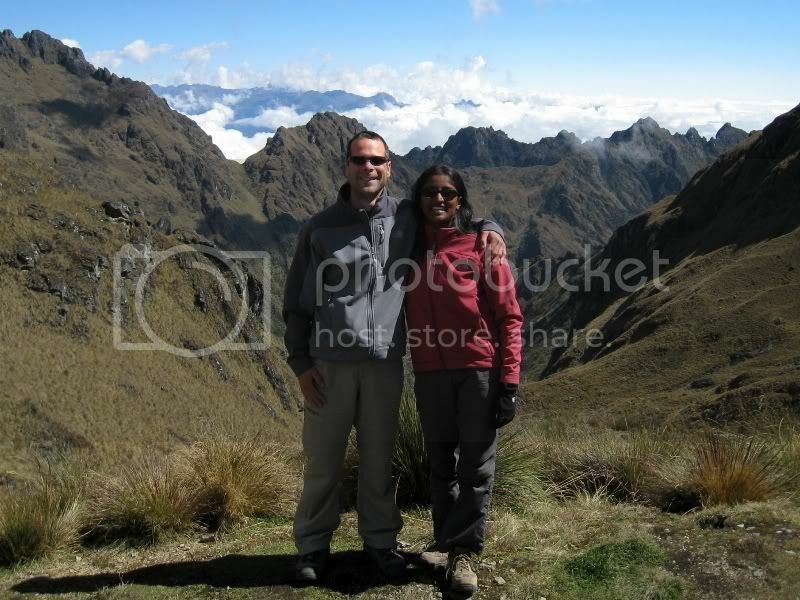 On the recommendation of Jeremy we decided to do the Inka trail trek (Thanks for the tip Jeremy!). 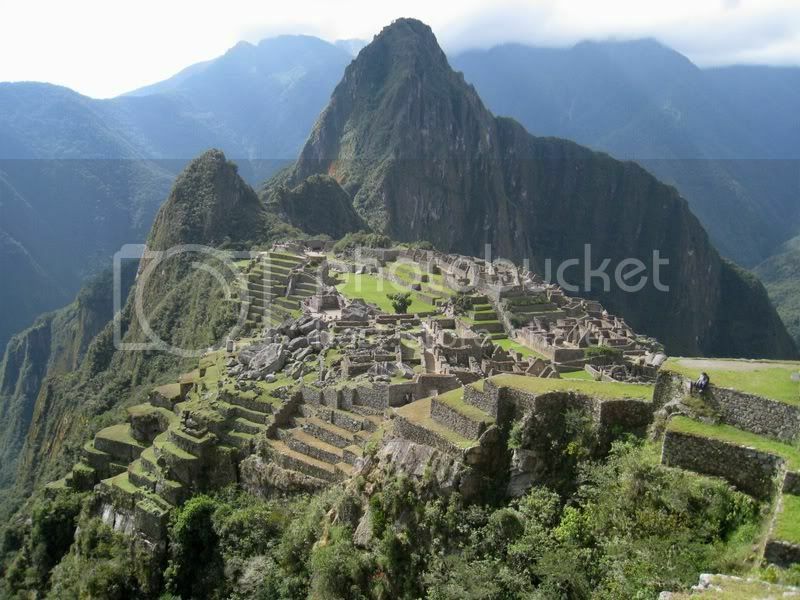 This is a 4 day/3 night trek where you arrive on the fourth day at Machu Picchu. Here our group passes the control point at kilometre 82. 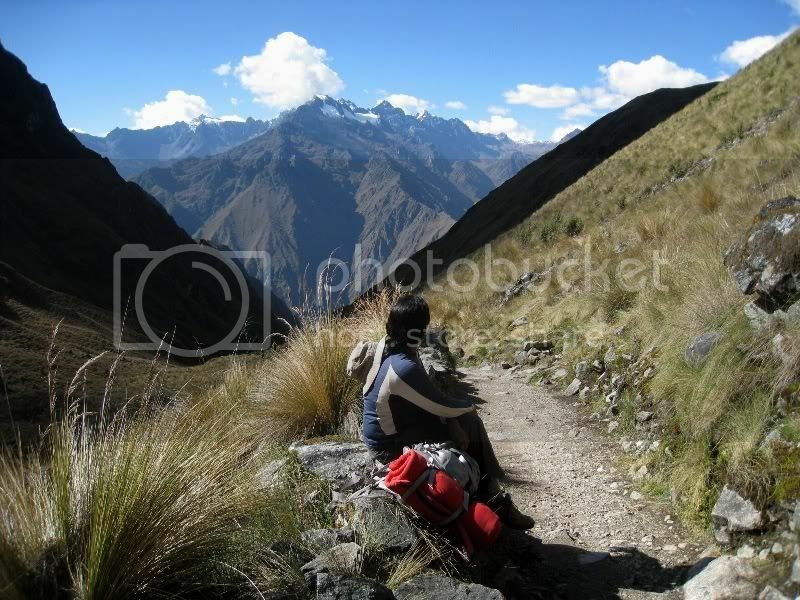 You hike through the heart of the Peruvian Andes and the views are amazing. Here is a close-up of Veronika mountain. 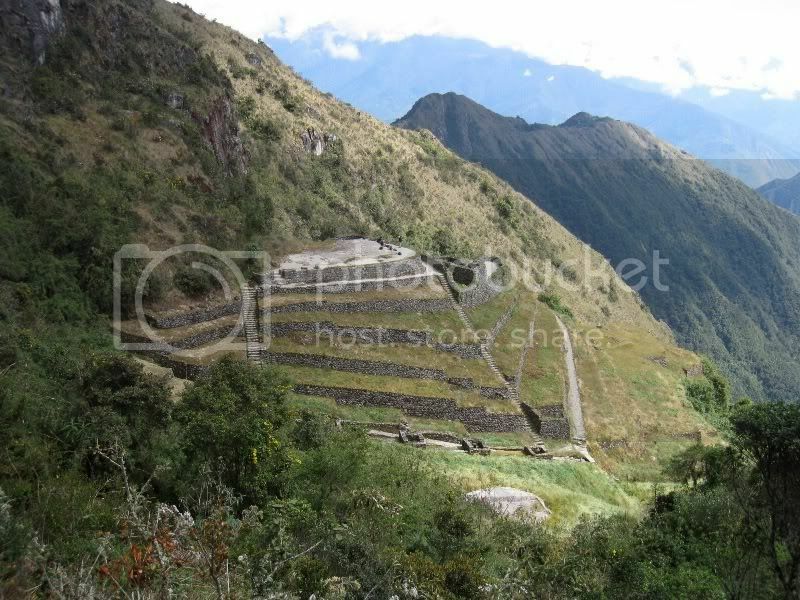 These are the Inka ruins of Llaqtapata. Due to the popularity of this hike it is nowadays highly regulated. 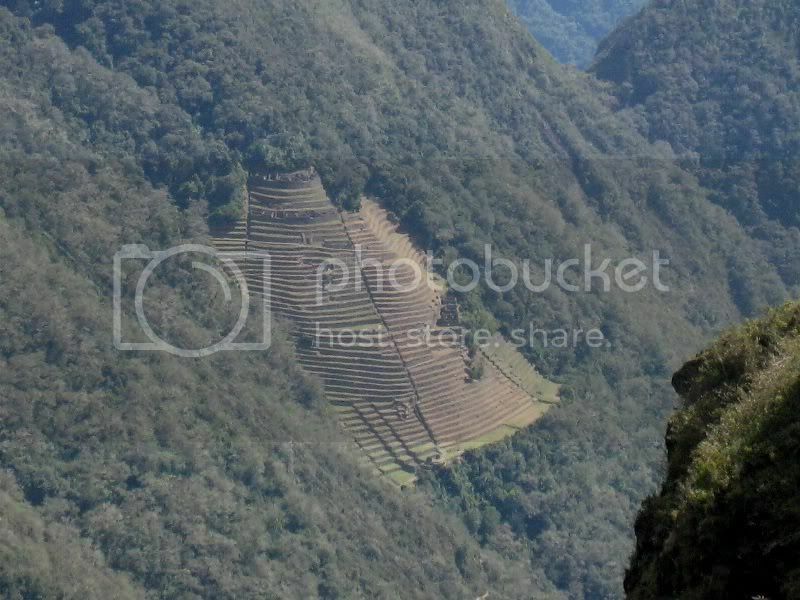 You can only do the hike with a guided tour. 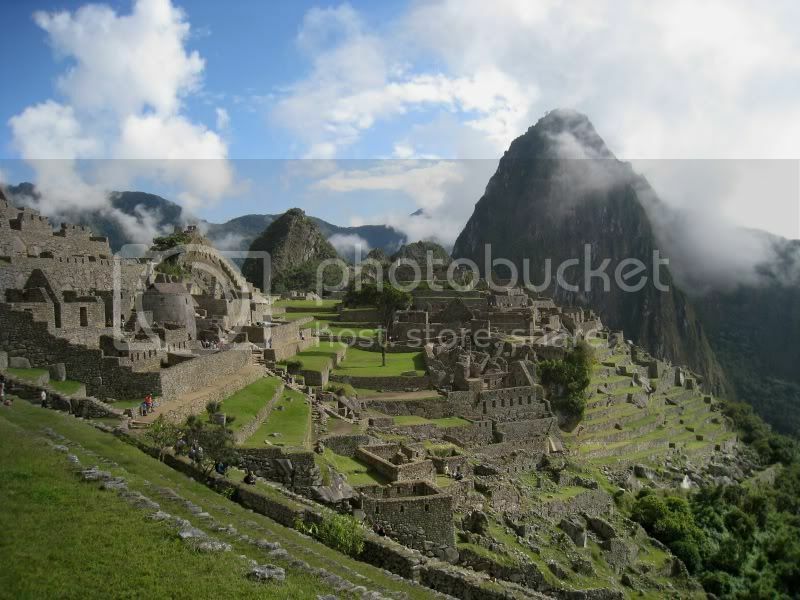 Our tour groups consisted of 14 tourists, 2 guides and 18 porters. 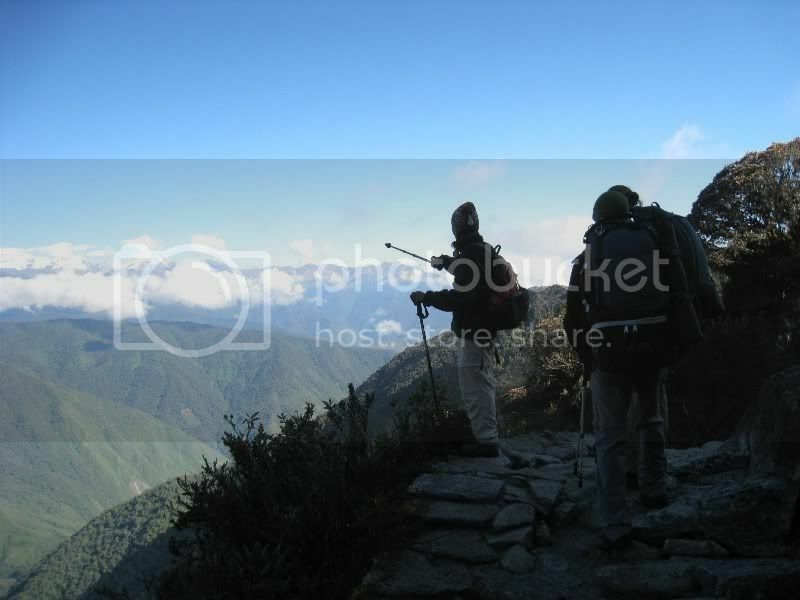 Here Jaya gets passed by our porters. 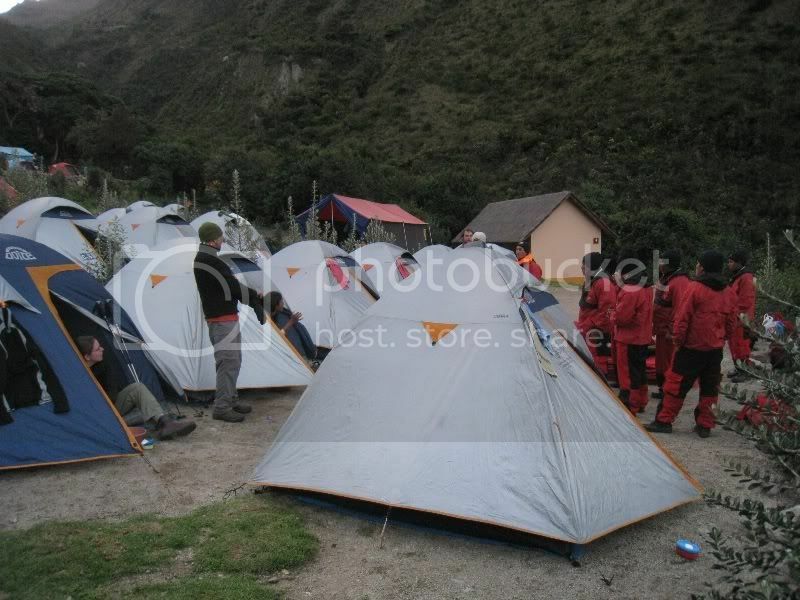 The porters usually just run by you and get ahead and set up everything in camp like dinner tent and all the tents to sleep in. 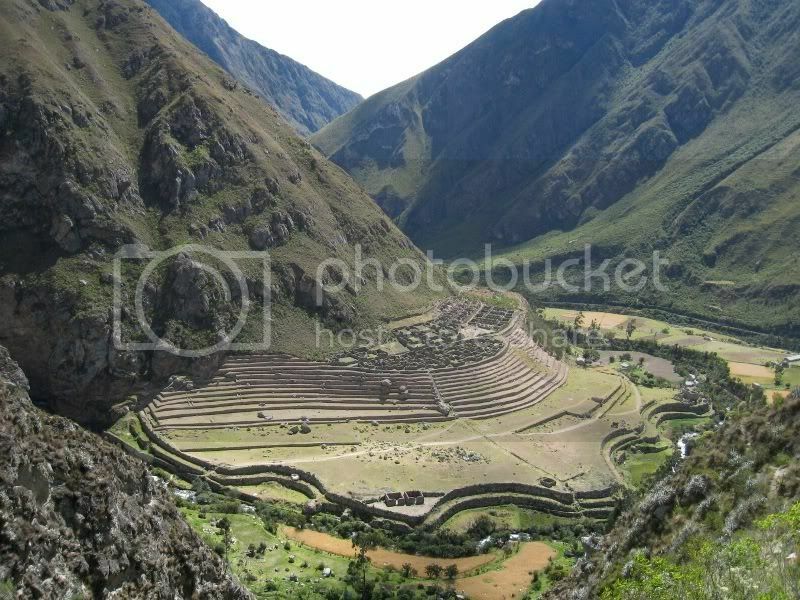 The Inkas established a wide network of roads in their empire and lots of it looked like the ones we hiked on. 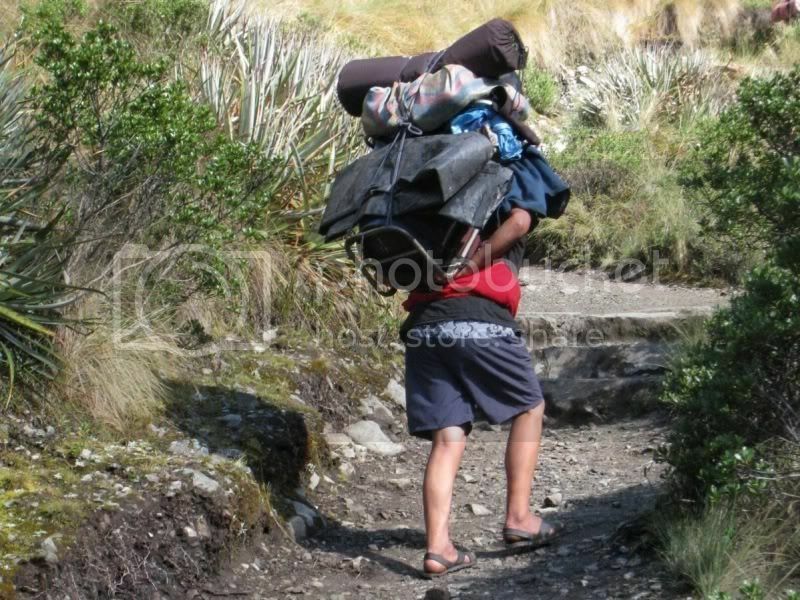 These porters do an amazing job and carry immense loads on their backs. Many of them do not even have proper shoes. 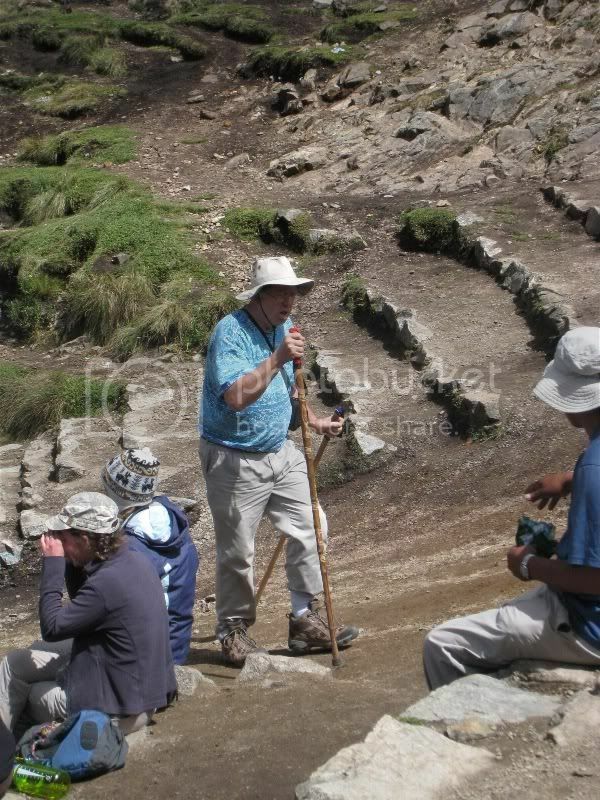 Just like this fellow who hikes in his sandals. 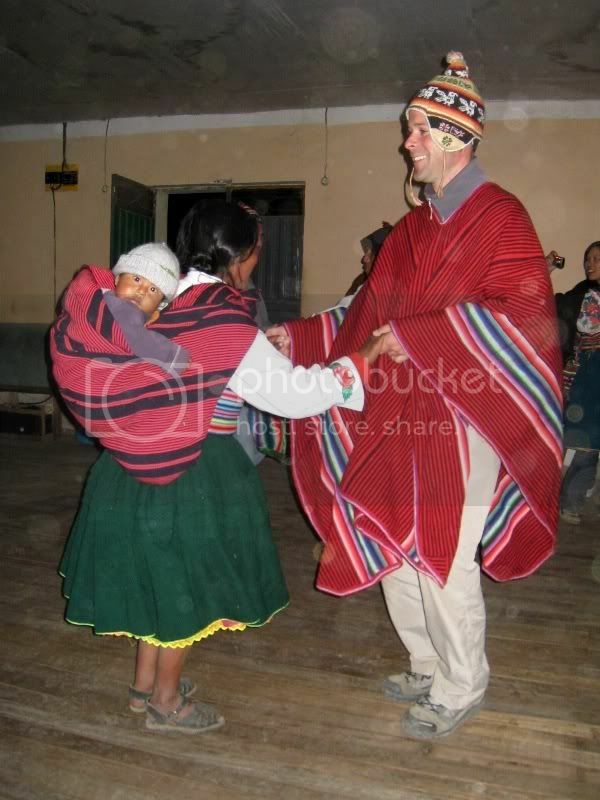 Our company (Llama Path) claims to treat their porters the best and provide them uniform and shoes. Taking a break on the second day on the way up to the Dead Woman´s Pass (4200 meters above sea level). 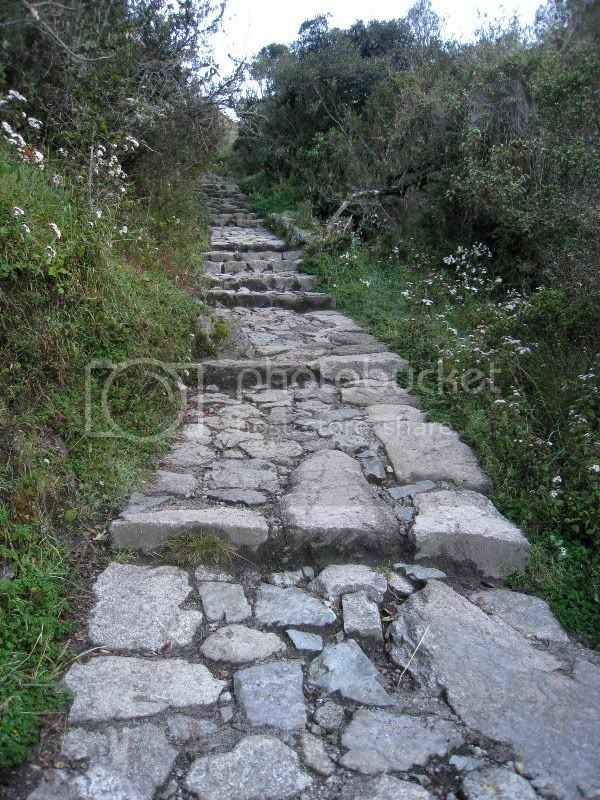 This was quite a hard climb and you really could feel the altitude. Happy to be on top. 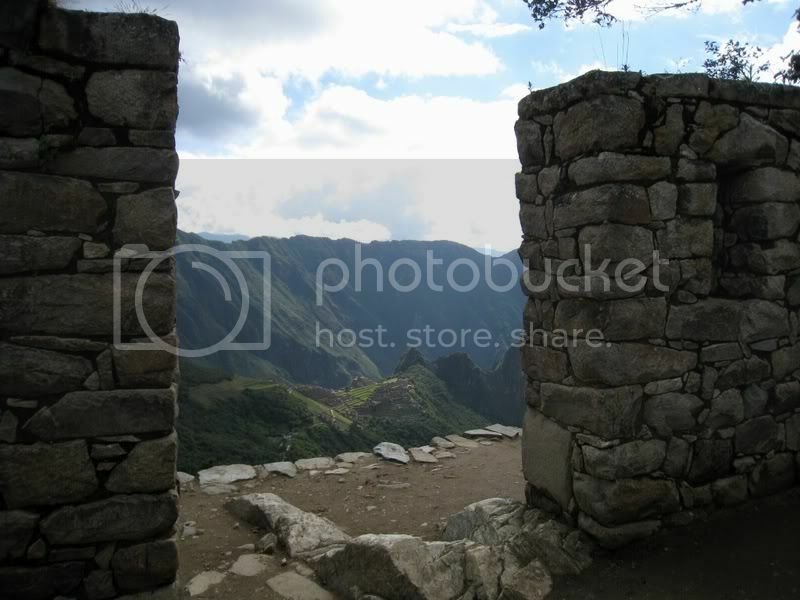 View into the next valley. On the opposite site you can barely make out the way up to the second pass. 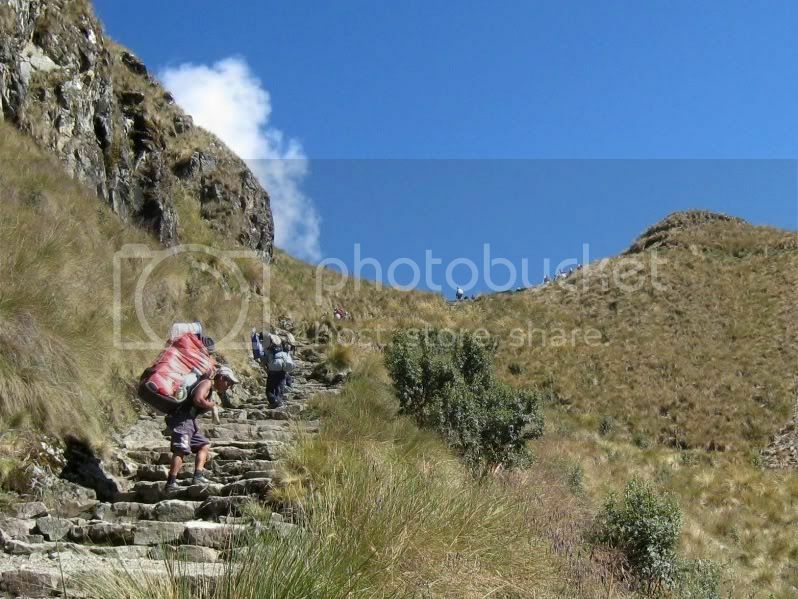 At the bottom of the picture you can see our little red army running ahead to setup the camp for lunch. 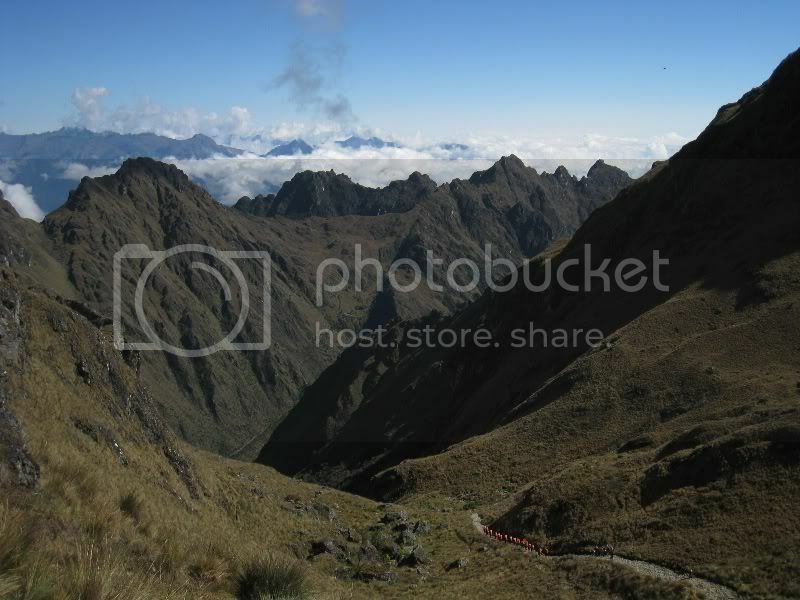 It took most of our group about 2 hours to climb from camp up to Dead Woman´s pass. 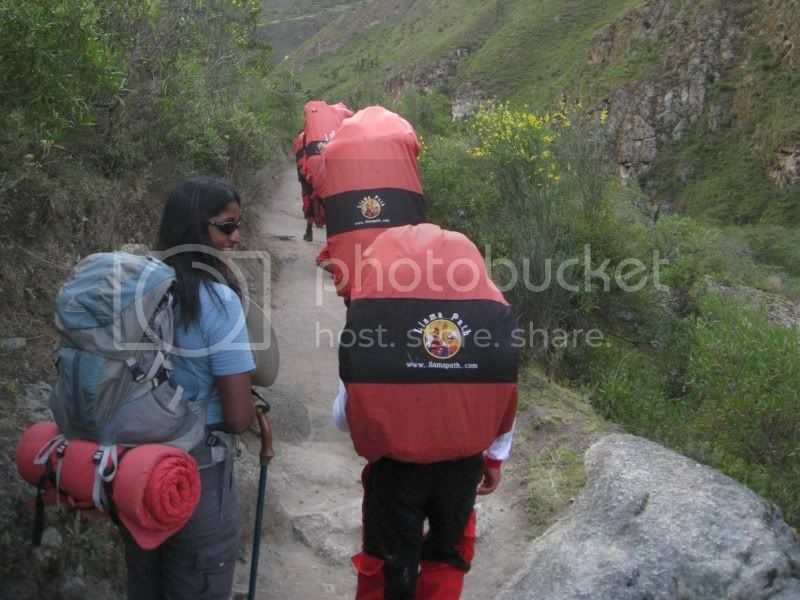 However then we had to wait 3 hours since some in our group overestimated their abilities when they signed up for the trek. 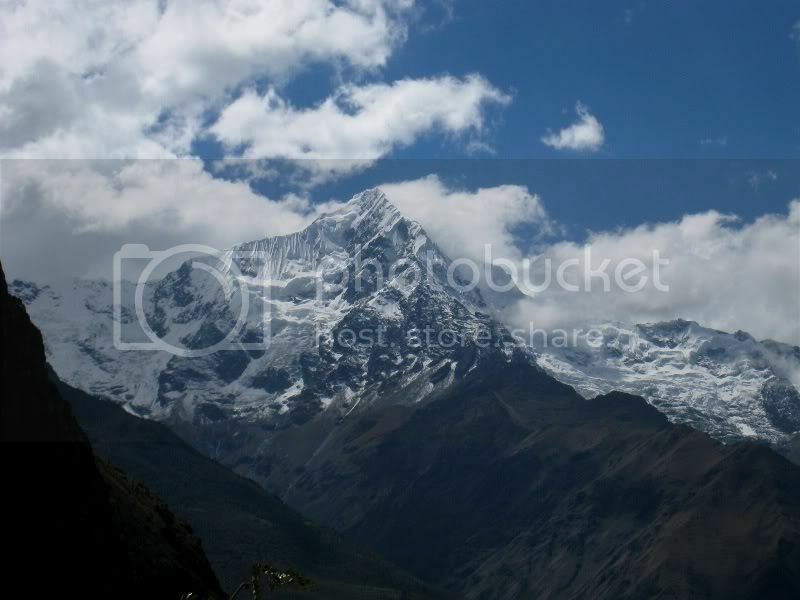 I think anybody in decent shape can do this trek, but it is necessary to be somewhat prepared and properly acclimatized. 4 people in our group were not up to it and had to pay the price with a 3 day suffer fest. Finally here the last one of the group arrived. We came along the Runkuraqay ruins after lunch on our second day on the way up to the second pass. 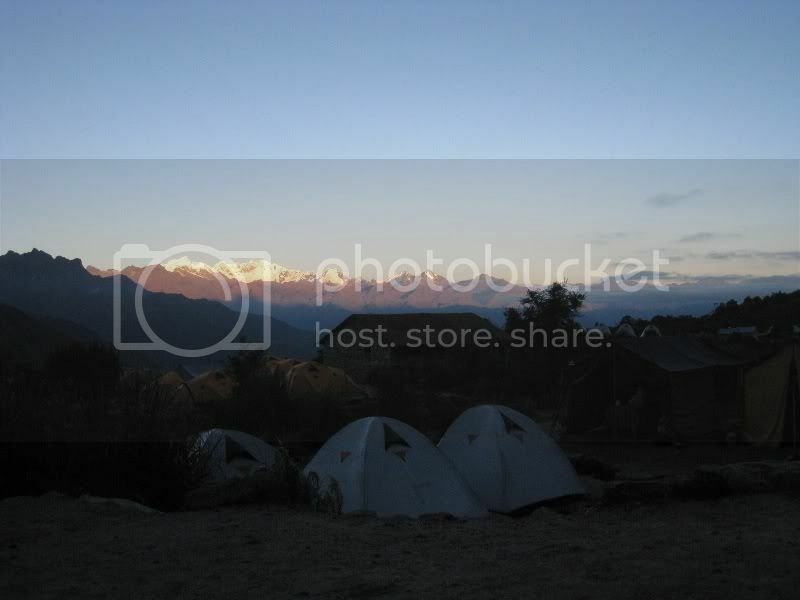 Morning light at the second camp site (taken from the tent). 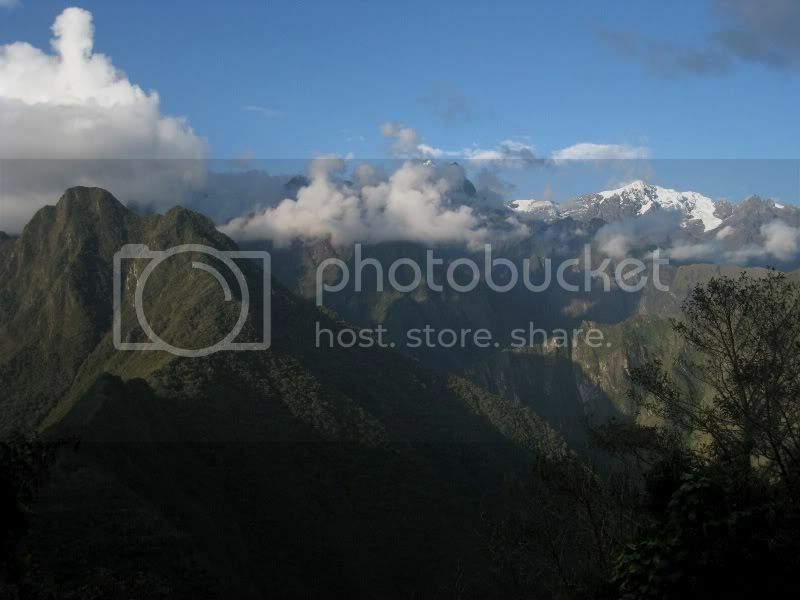 This Inka trek is the luxury version of a trek experience. The porter and guides take care of anything. 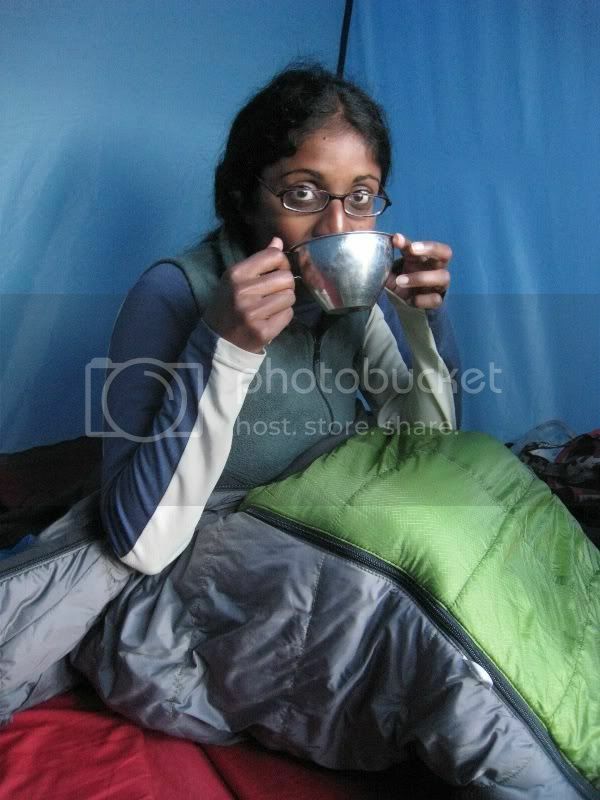 In the morning they wake you up and provide some warm water to wash your face and a hot cup of coca tea and all this in the tent! Our guide pointing out some of the mountains on the third day. 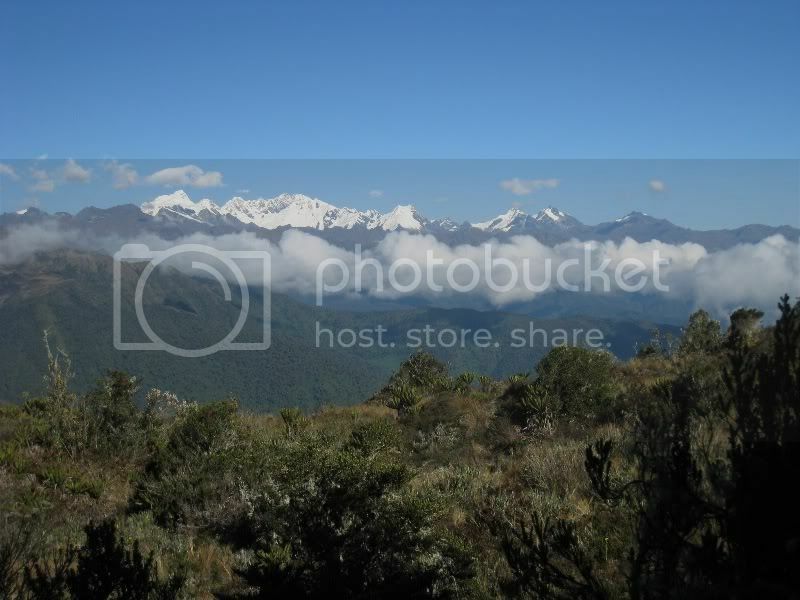 We had unbelievable luck with the weather and enjoyed perfect conditions during the hike. 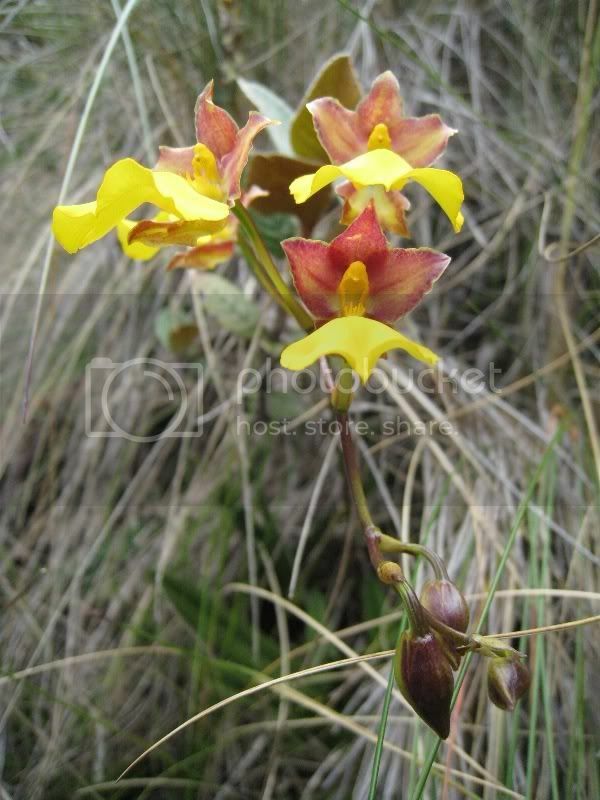 After the relatively dry climate during the first days on the high altitude passes you descend on the third day through thick jungle and cloud forest filled with tropical flowers and colourful orchids. 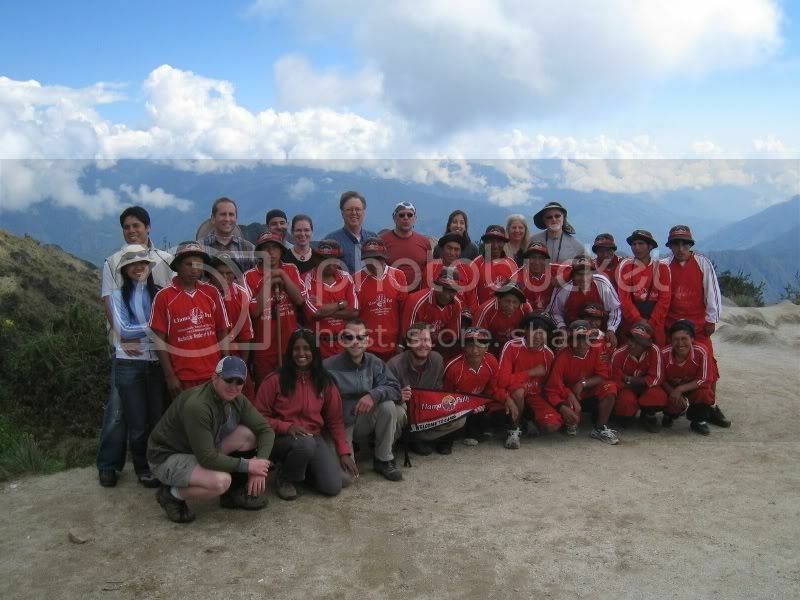 Here is our whole group including porters before descending to our campsite for the 3rd night. 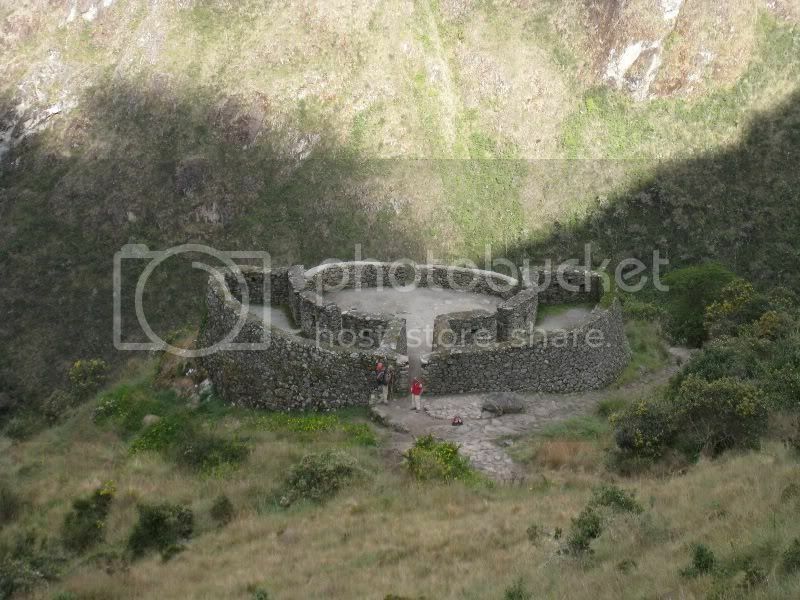 From here it went down some very steep stairs into the Urabamba valley. Good thing we had those hiking poles. 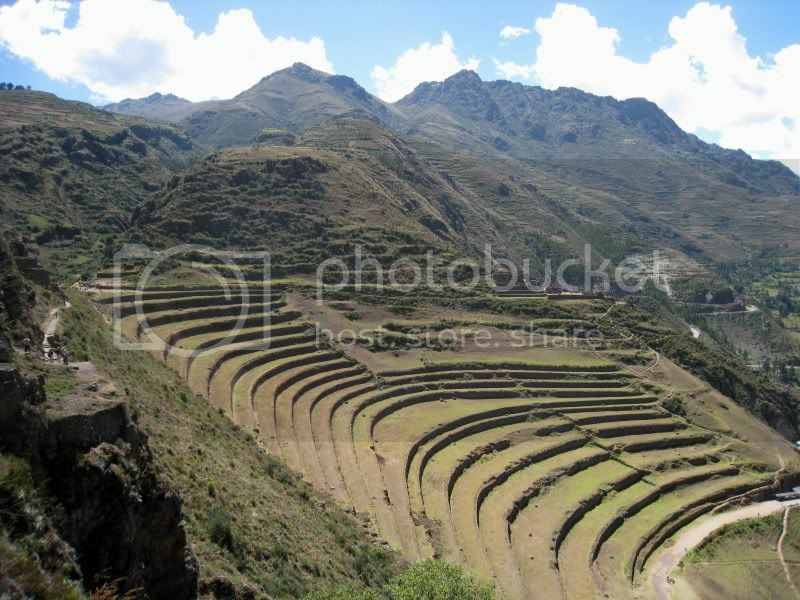 The Inkas were masters of building the terraces to grow grain and corn. 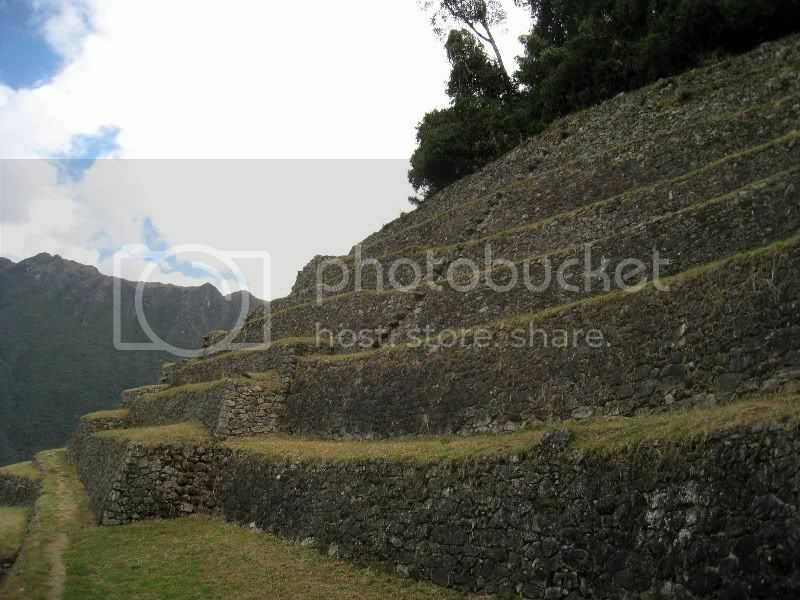 Here you can also recognize how to climb from one terrace to the next with the rock ladders. The view out of our tent at the third camp site. Not too bad! The ruins of Winawayna near our third camp site. On the fourth day we had a very early wake-up call. 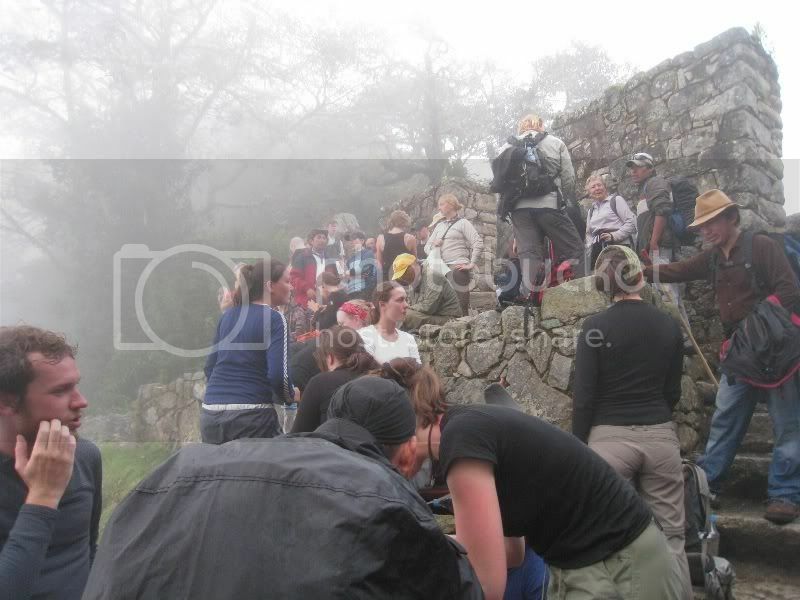 The control point opens at 5:30 and then everybody tries to race up to the sungate. 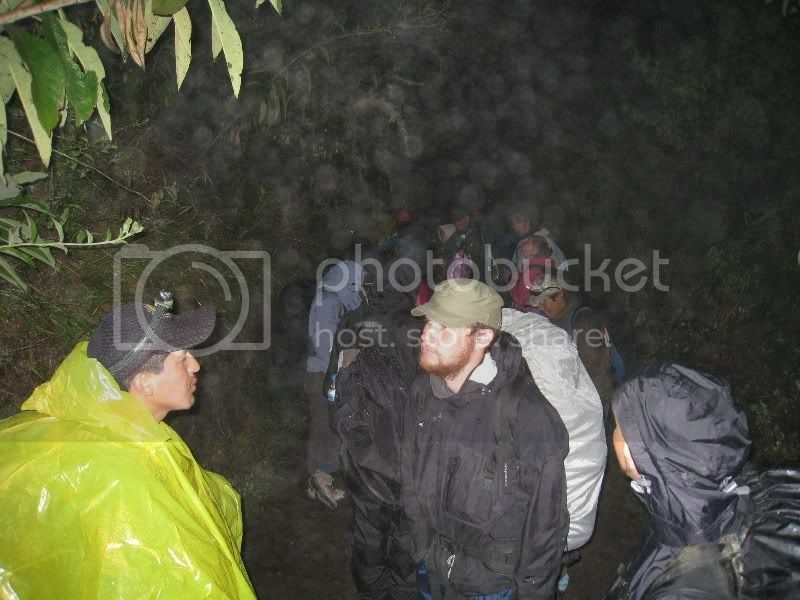 Unfortunately it had rained that night and all that moisture caused some thick fog. This is the disappointed crowd trying to figure out if they should wait it out at the sungate or descend down to Machu Picchu. 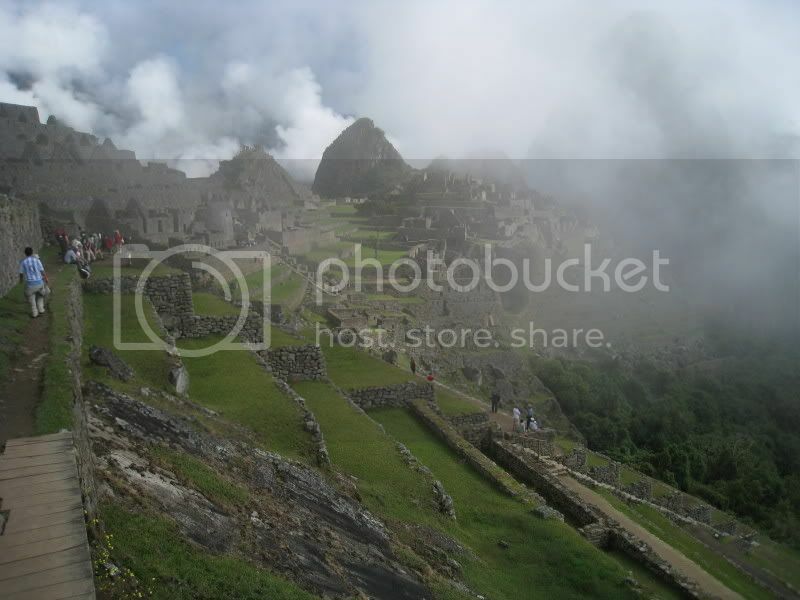 We ultimately decided to hike down and slowly but surely the fog started lifting. It was quite a mystical experience. Later on we enjoyed a nice sunny day. 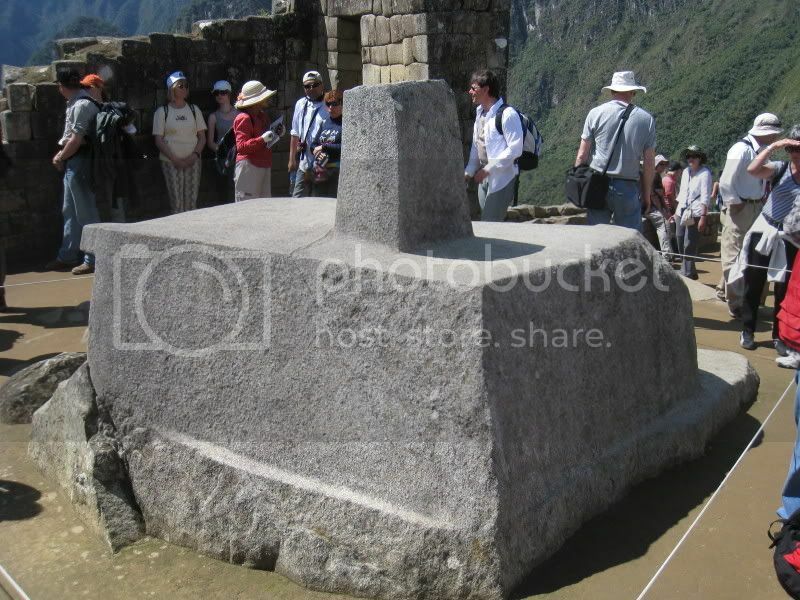 This is the Intihuatana stone. This works similar to a sun clock. At midday on March 21st and September 21st the sun stands directly above the pillar creating no shadow at all. 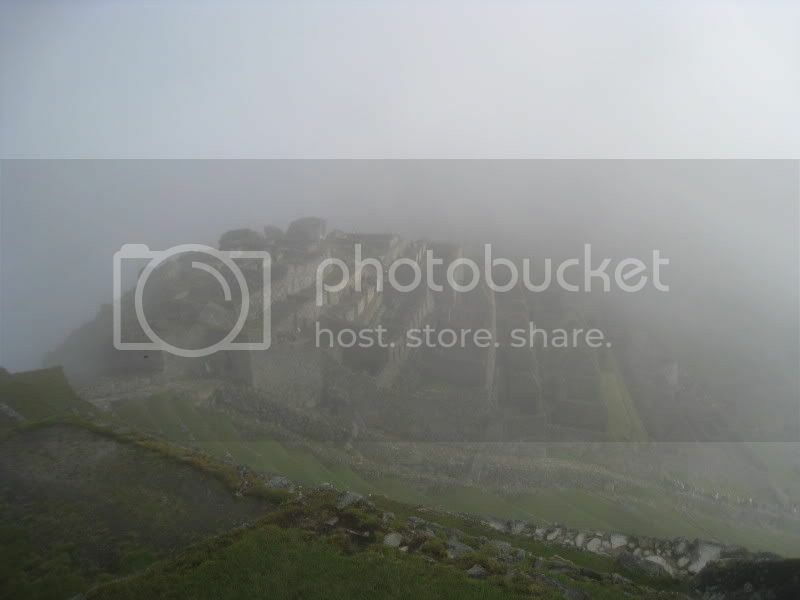 A panorama of the Machu Picchu site. 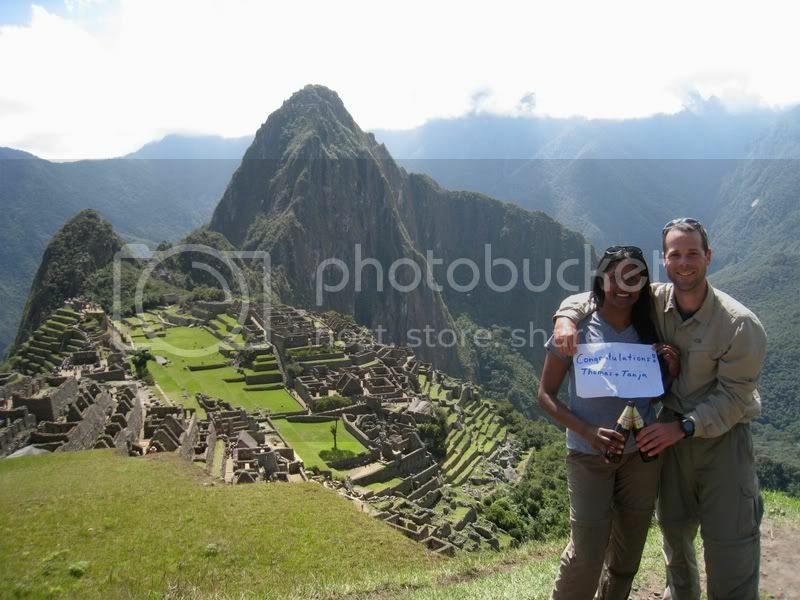 My good friend Thomas Fritsche got married that Saturday (May 16th) when we arrived at Machu Picchu and unfortunately we could not join his wedding in Switzerland. However we sent him this congratulation picture a few days later. The site from another angle. 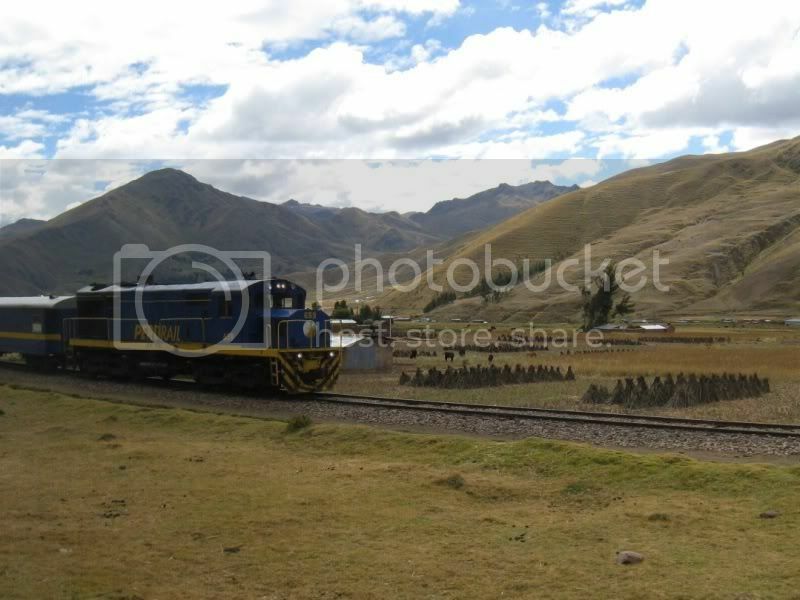 Afterwards we took the train from Aguas Caliente back to Cuzco. 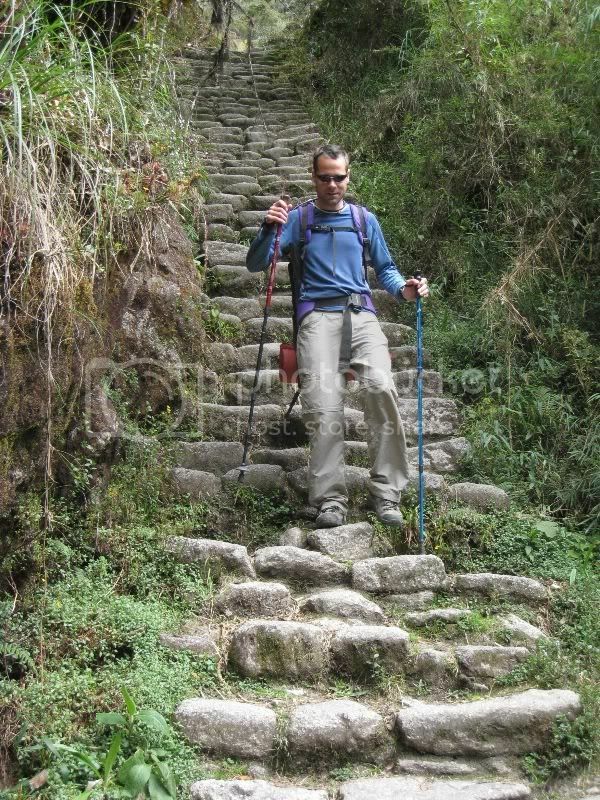 This trek is a nice way to get to Machu Picchu and enjoy the spectacular scenery and Inka ruins on the way. We had a great time. 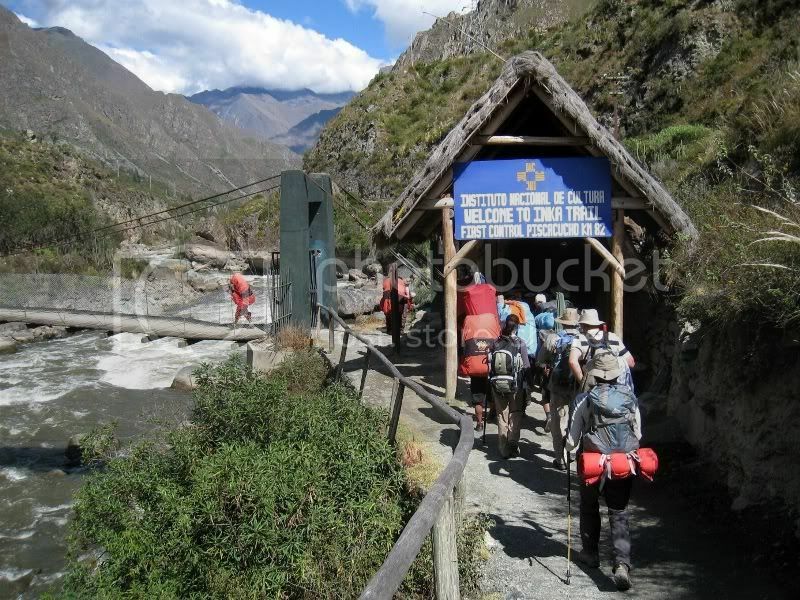 The problem though nowadays is that it is extremely popular and every day 500 people (including porters and guides) start the trek. 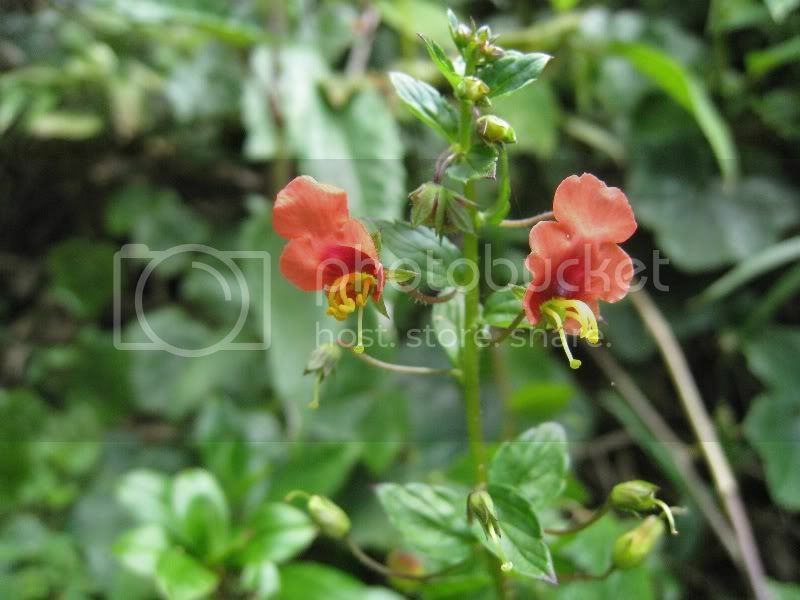 Therefore it has lost some of its appeal. 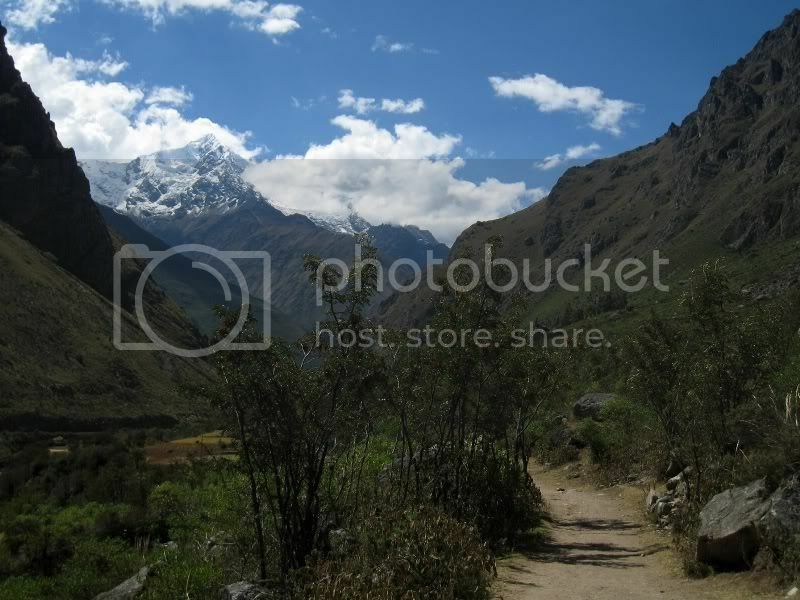 There are also other good options like the Salcantay trek. 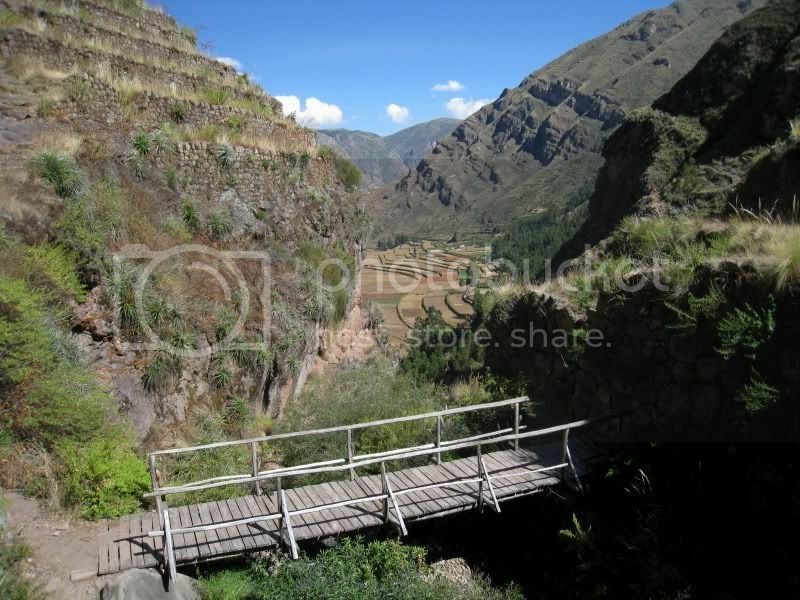 A few days later we visited the market in Pisac, hiked up to the ruins and checked a few more places out in the sacred valley. 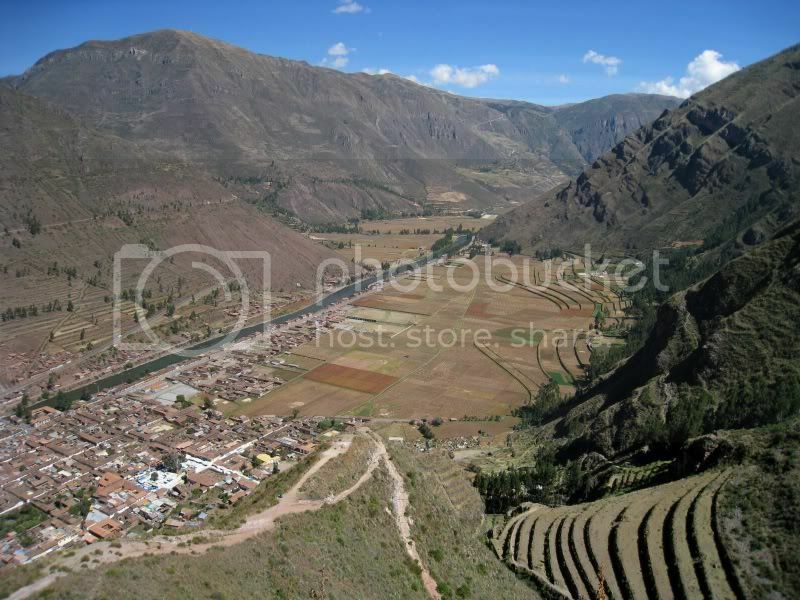 This is the view down onto the town of Pisac. What´s a blog post without a bridge??! 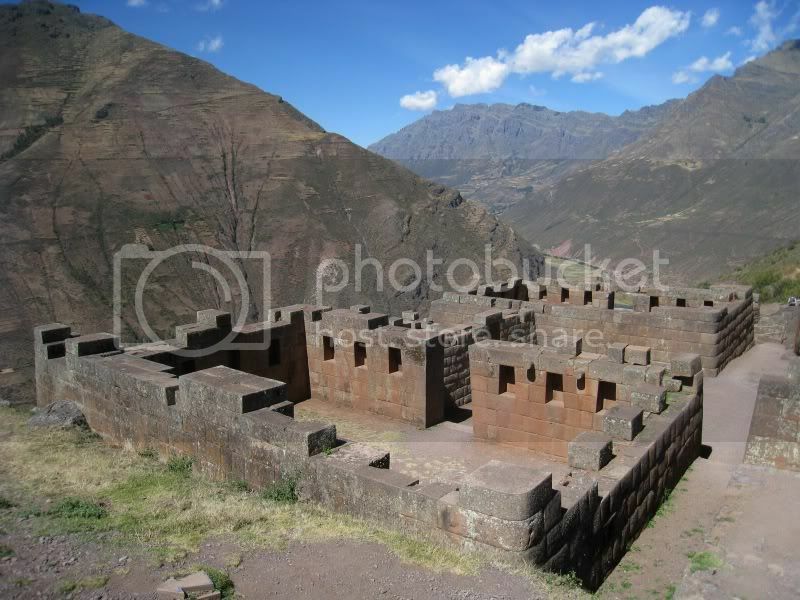 Some of the ruins of Pisac. 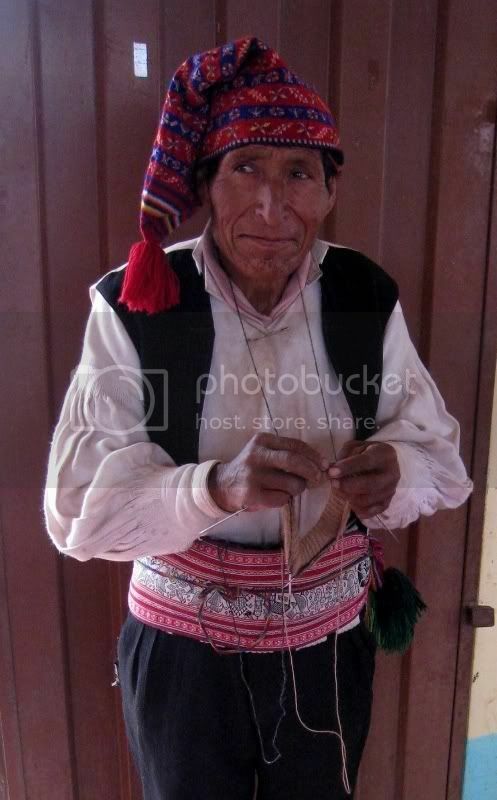 Afterwards I was supposed to go on a 3-day river rafting on the Apurimac river. Unfortunately I got quite sick and had to recover a few days in the hotel. Still a bit weak from the illness we decided I have to scratch the river rafting trip and instead headed to the coast to Nazca. 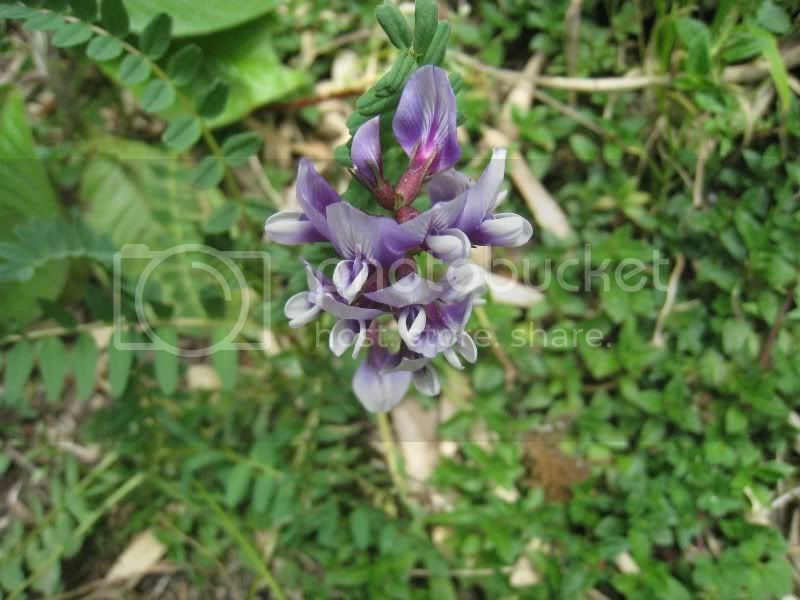 More about that in the next post.